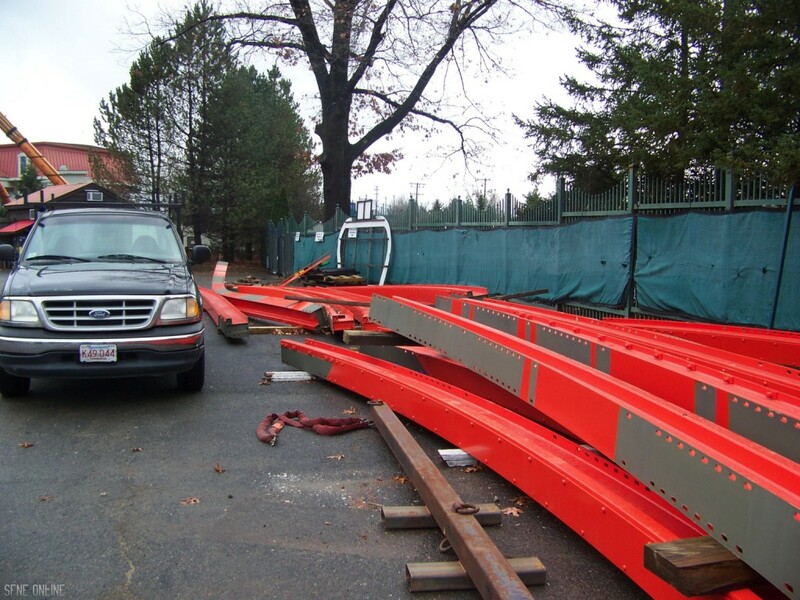 We were able to get up-close and personal with Six Flags New England’s newest coaster during our first Wicked Cyclone construction tour! 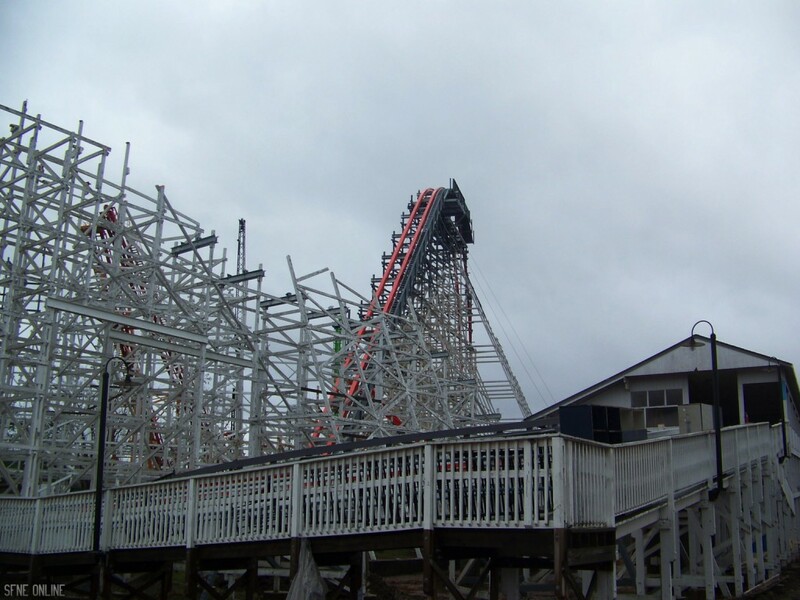 The tour was open to a few enthusiast websites and the local news stations. Since it was such an exclusive event, we were all able to park inside Crack Axle Canyon. It was pretty cool being able to drive inside of a closed theme park. From there we walked through the maintenance gate and went on to do the tour. 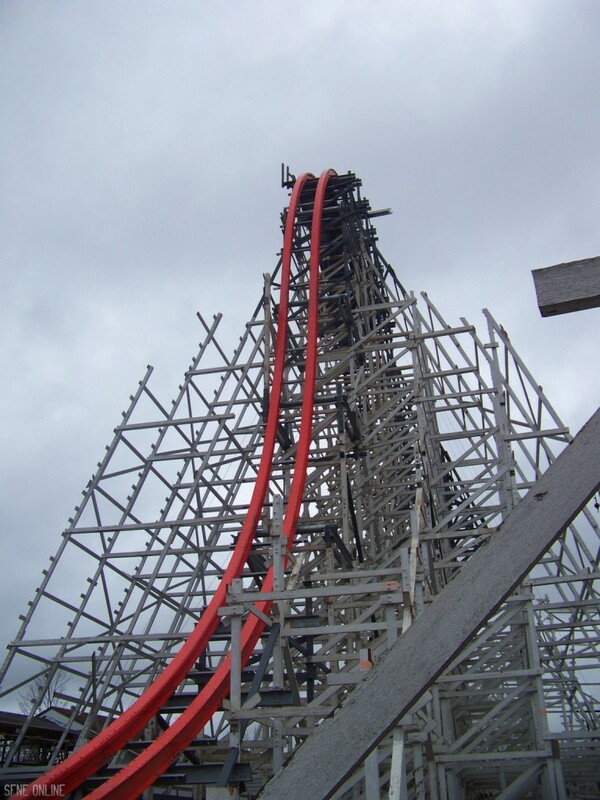 The first thing we saw was the intense-looking first drop! 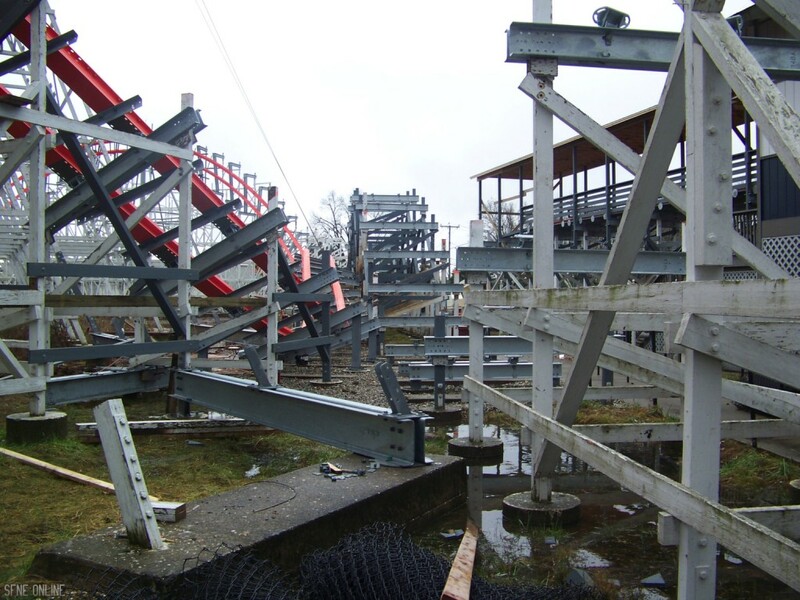 This is where the outside banked airtime hill will be. 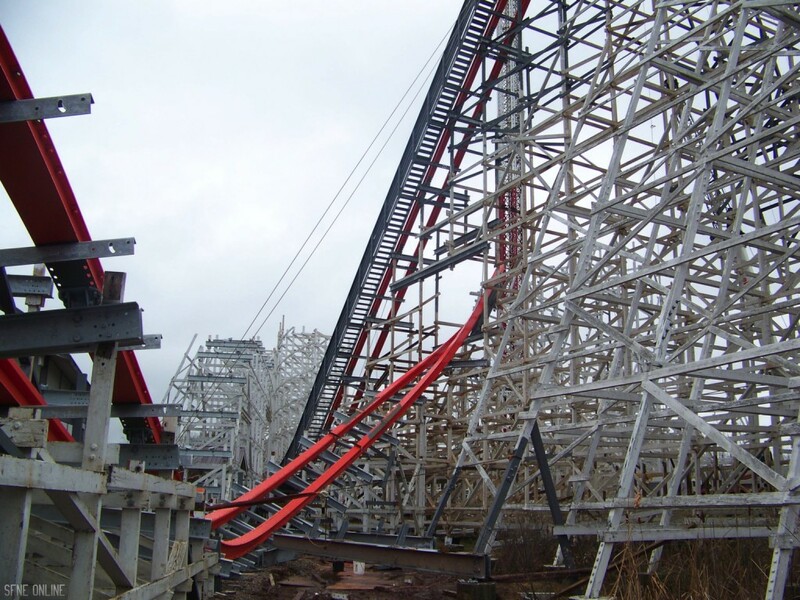 I think this drop will provide an insane amount of airtime, just like the original Cyclone’s first drop. 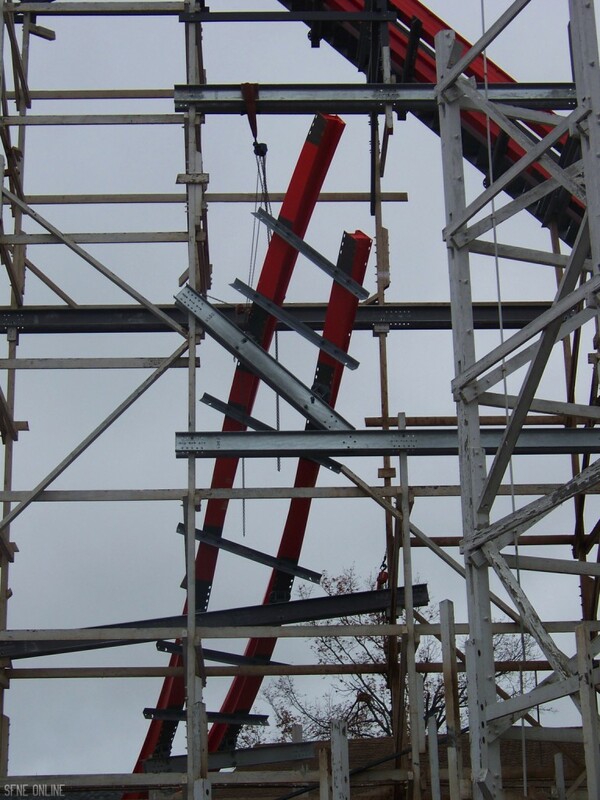 You can also see where the first zero-g roll will be. 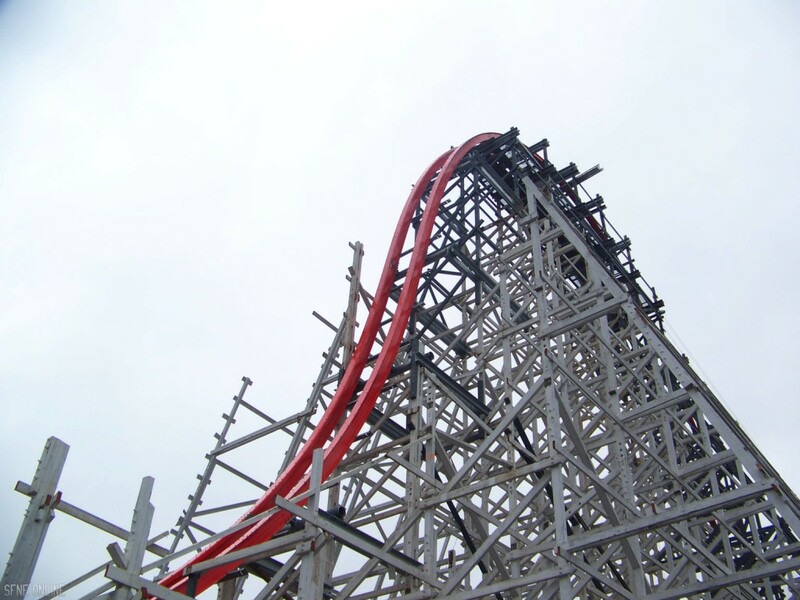 Immediately after the first drop, riders enter a 120-degree overbanked turn. 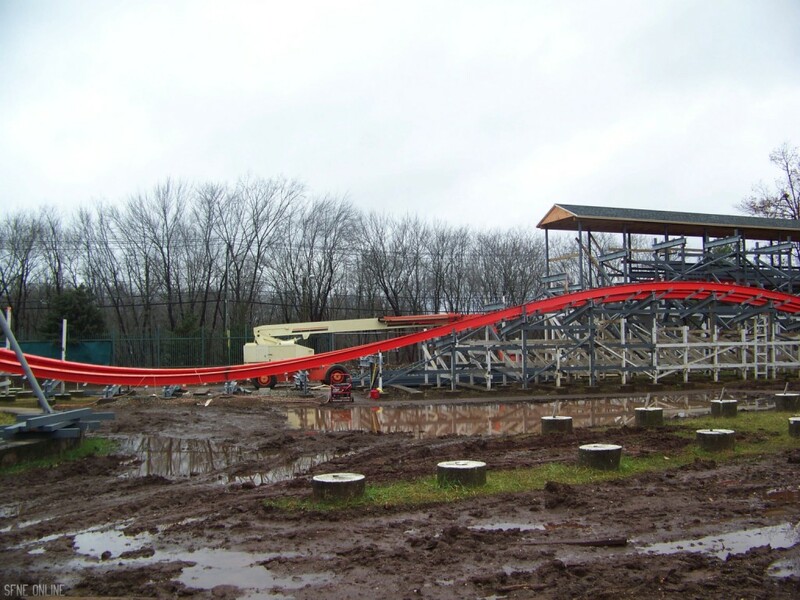 From there they go into a small airtime hill the banks outwards slightly. 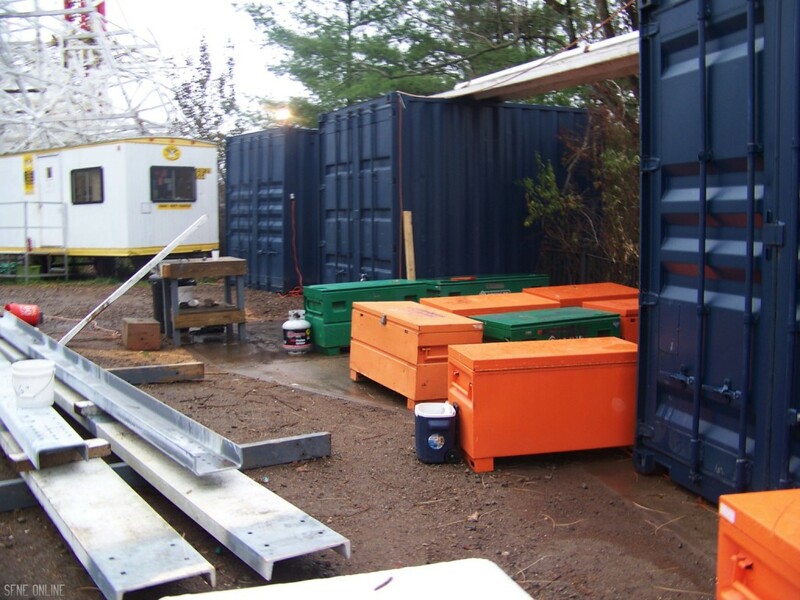 … and here is where they will exit. 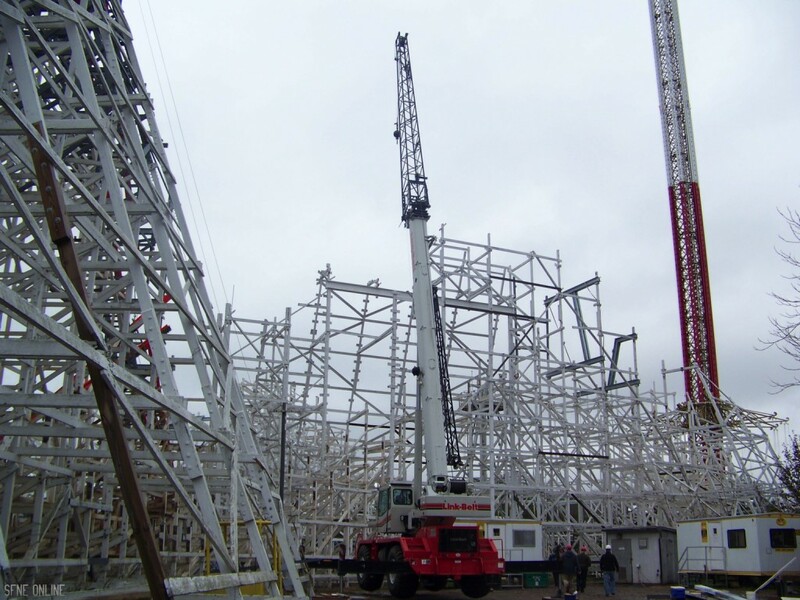 Like I’ve mentioned in some of our past updates, this support tower from the original Cyclone will be remaining for Wicked Cyclone. 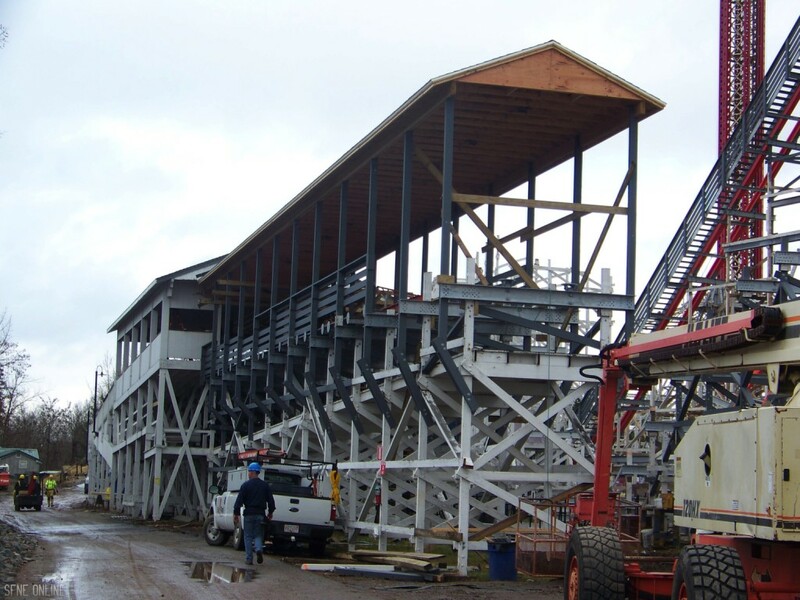 Somehow they are going to use it to support the overbanked turn. It’ll be interesting to see how that works. 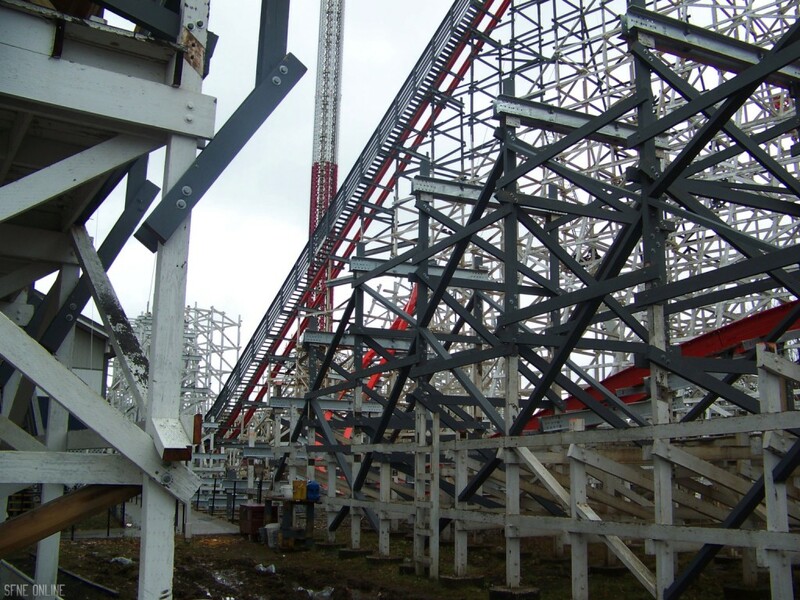 The track is starting to turn into the 200-degree stall element. 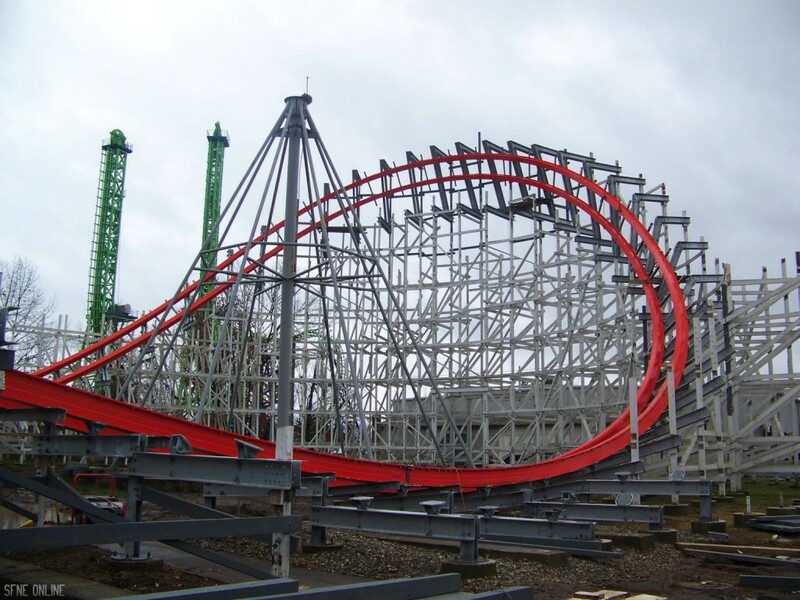 I think this may be what I’m looking forward to most about Wicked Cyclone. 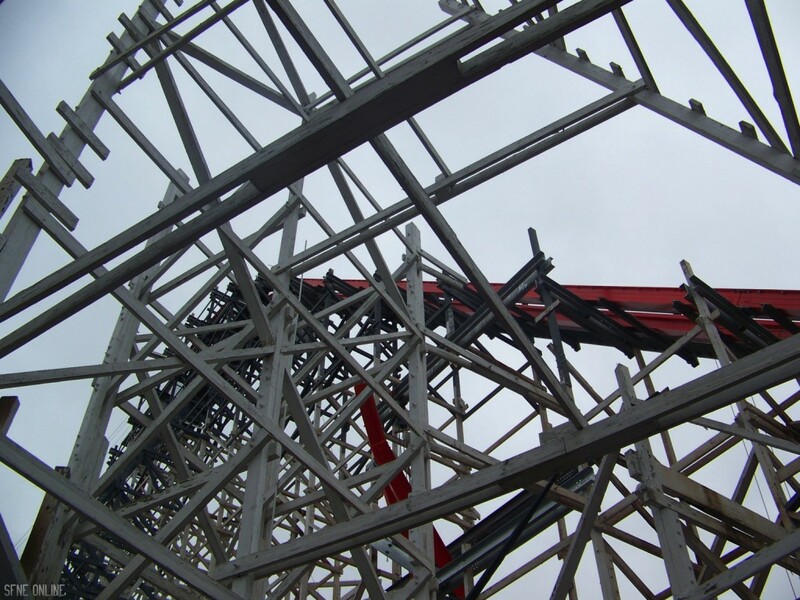 You can see the shape for the double down. 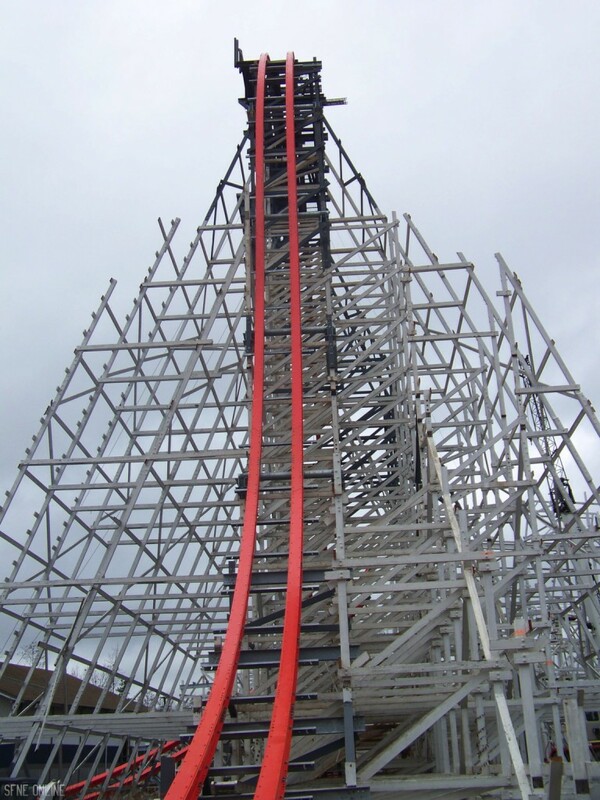 Speaking of that, the track for the double down is on site. You’ll see that later in the update. 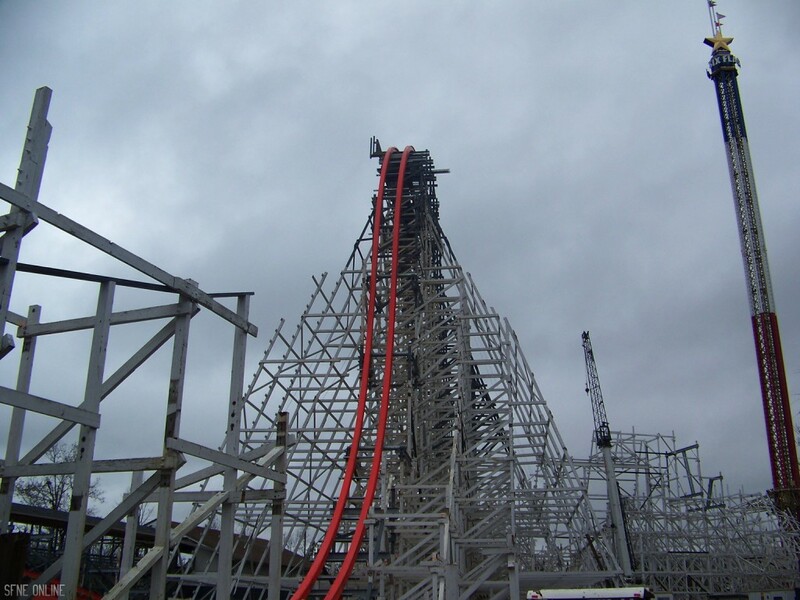 Up-close with the first airtime hill on the ride. This is the one that slightly banks outwards. 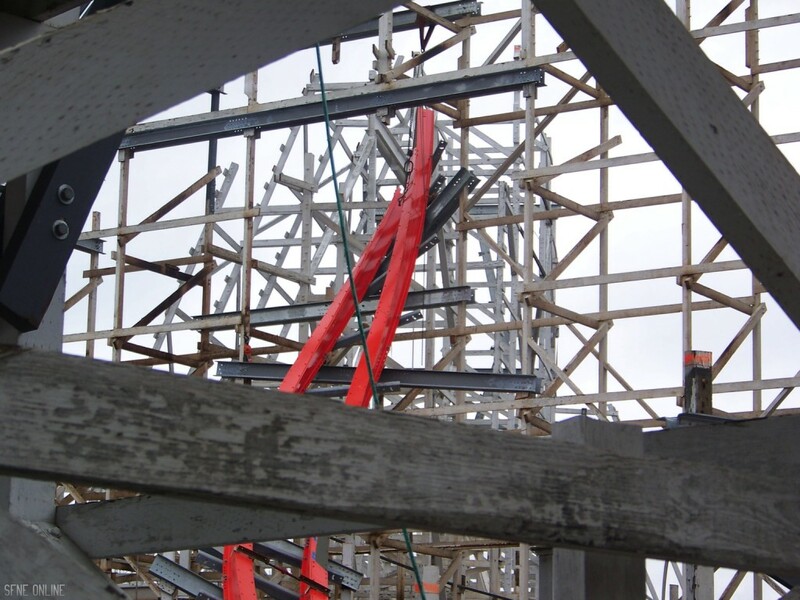 Zoomed in view of the crossbeams for the double down. 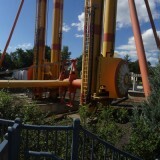 Now on the other side of the coaster… This is the exit of the 200-degree stall. 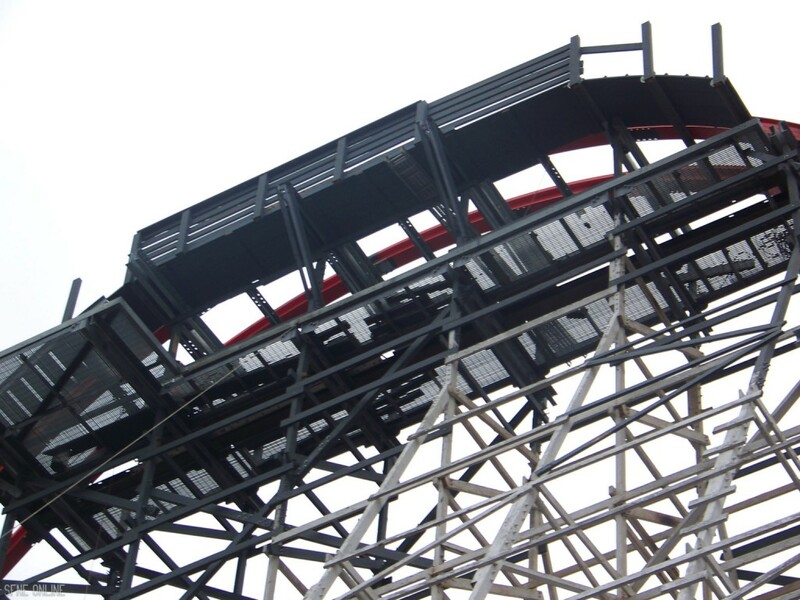 On the right edge of this picture, you can see where the 200-degree stall begins to change into the second overbanked turn. Pandemonium is painted! 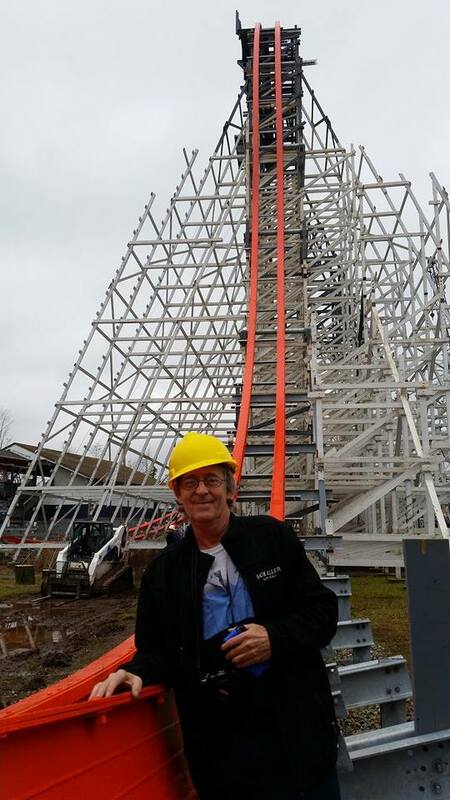 The whole coaster has received a fresh coat of paint and is ready for opening day on April 11! 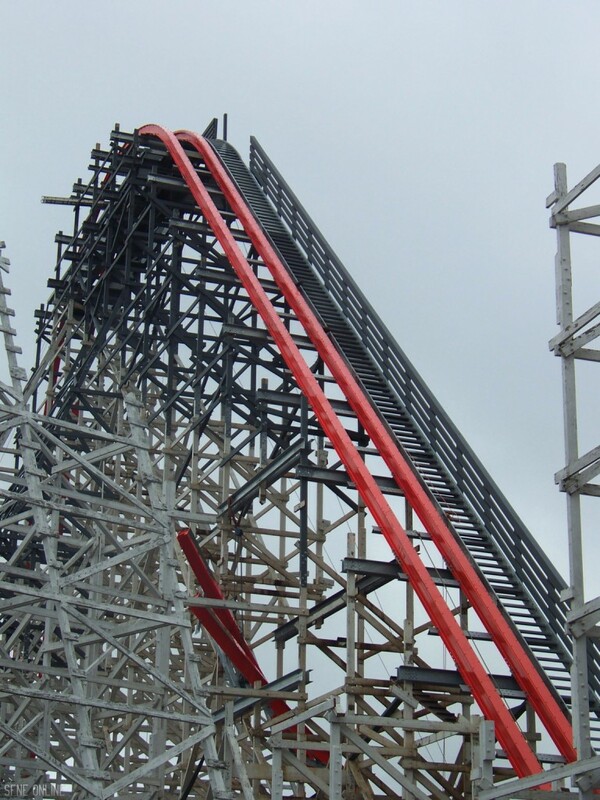 The coaster finally looks beautiful again. Here’s a shot of the entrance to the 200-degree stall from where the pictures above were taken. 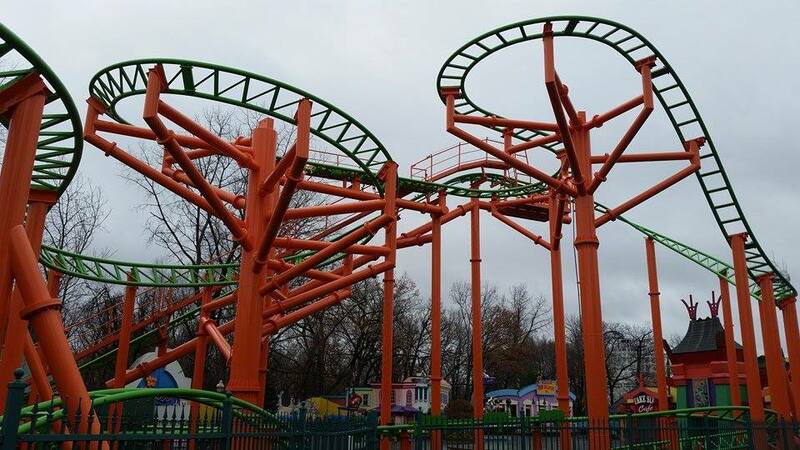 It twists is so many directions! 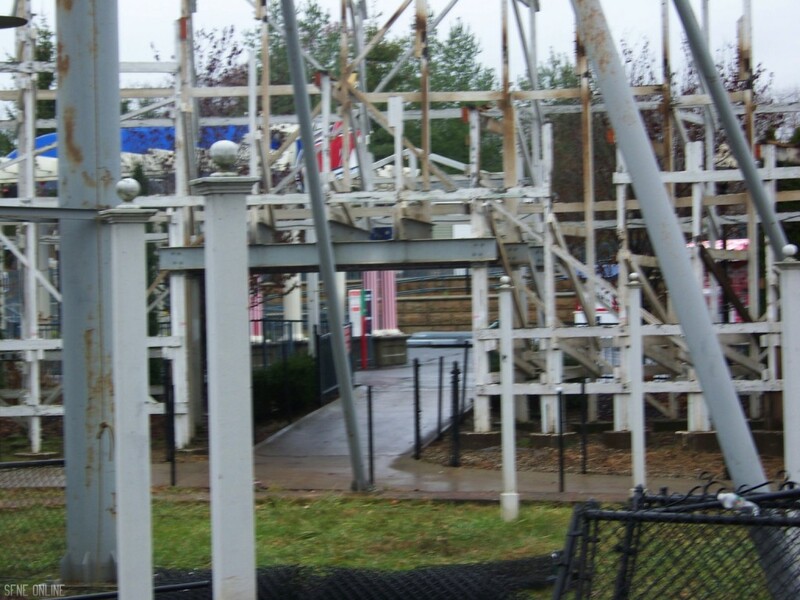 Now we’re in the queue area that was used during the last six or seven years of Cyclone’s operation. 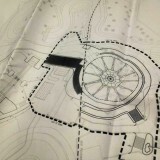 They will be reusing this portion as well as the entrance. 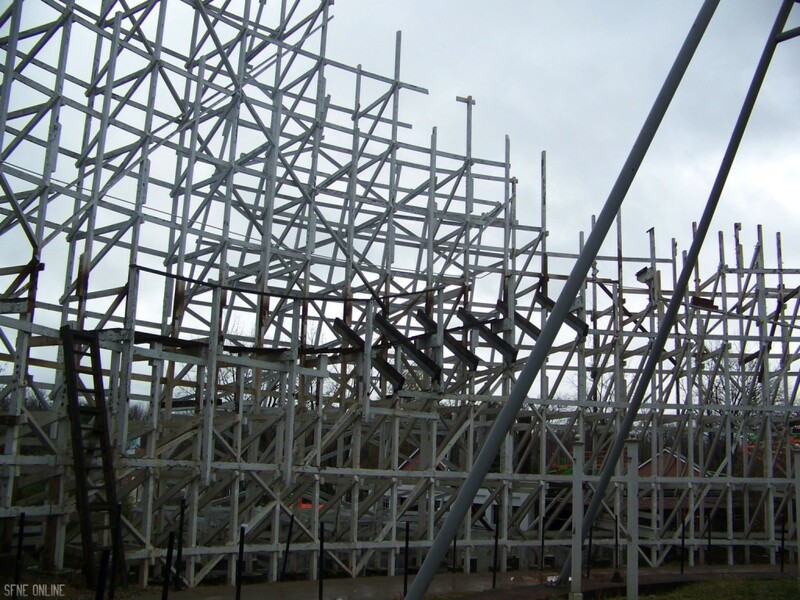 The fences are going to be much higher due to Wicked Cyclone’s lower profile. 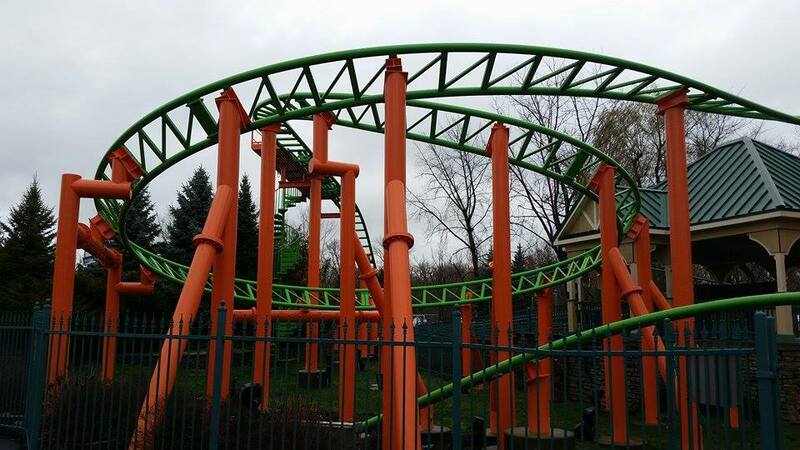 I imagine it will look a lot like the queue for Medusa Steel Coaster. 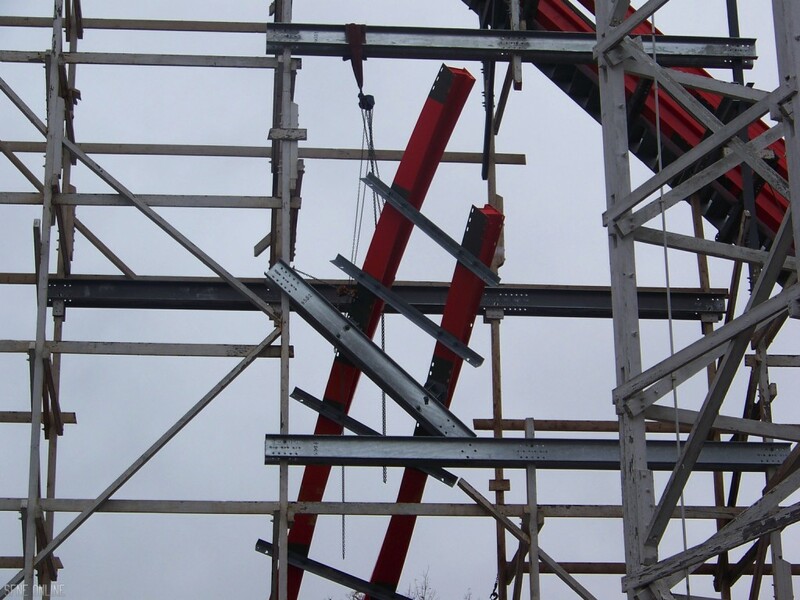 Once again, I’m not quite sure what they’re using this piece of steel here for. 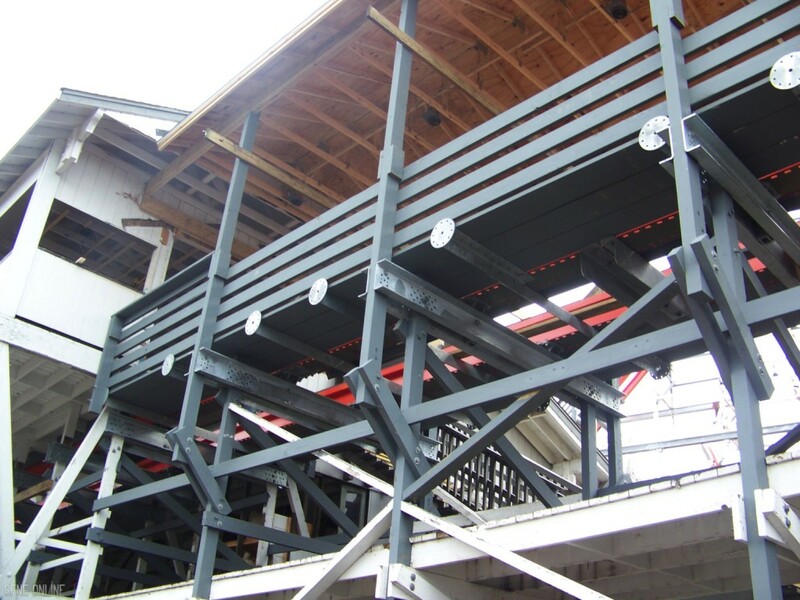 It could be for extra bracing for the supports going up into the 200-degree stall. 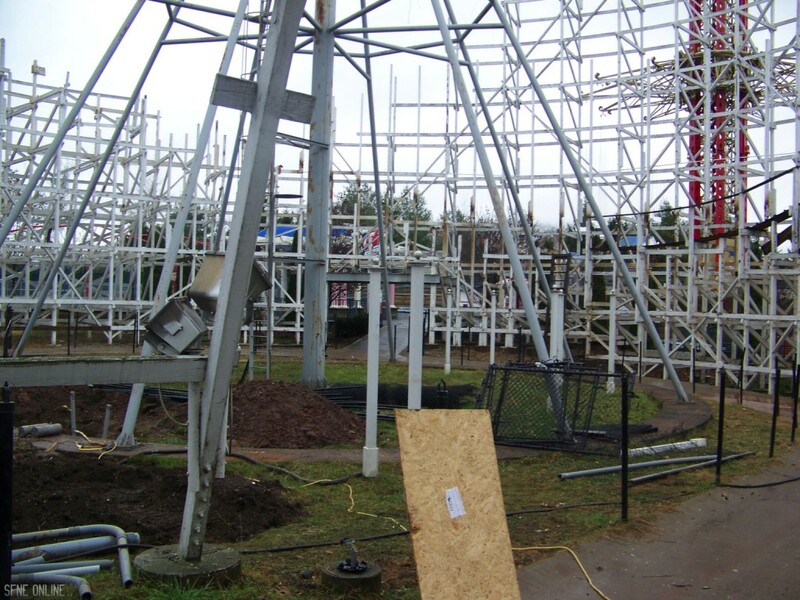 Pretty soon a small airtime hump and an overbanked turn will be in this area! 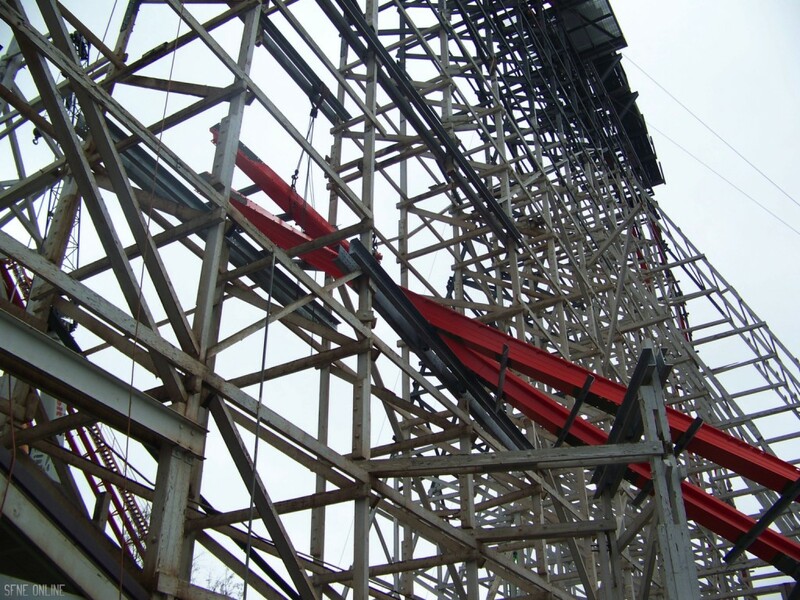 The lift hill went from a 30-degree incline to a 45-degree one. 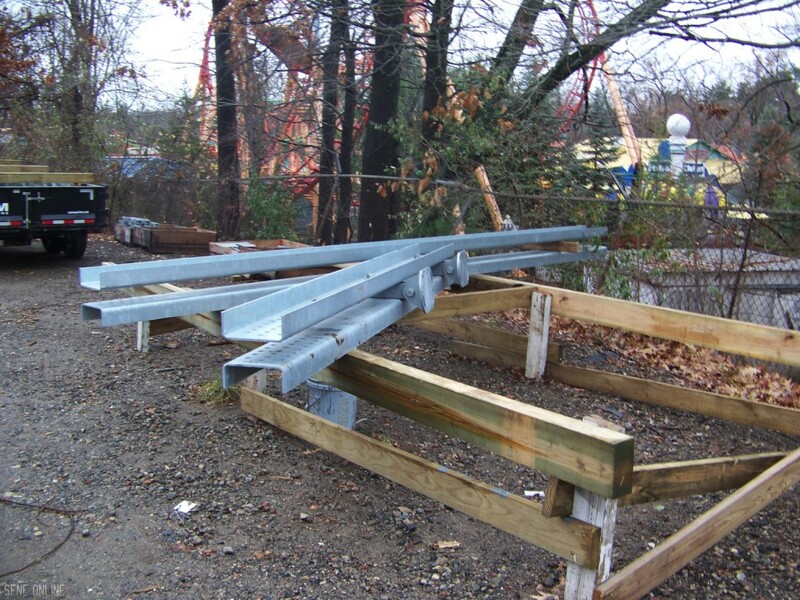 This allows for Wicked Cyclone’s steeper first drop. 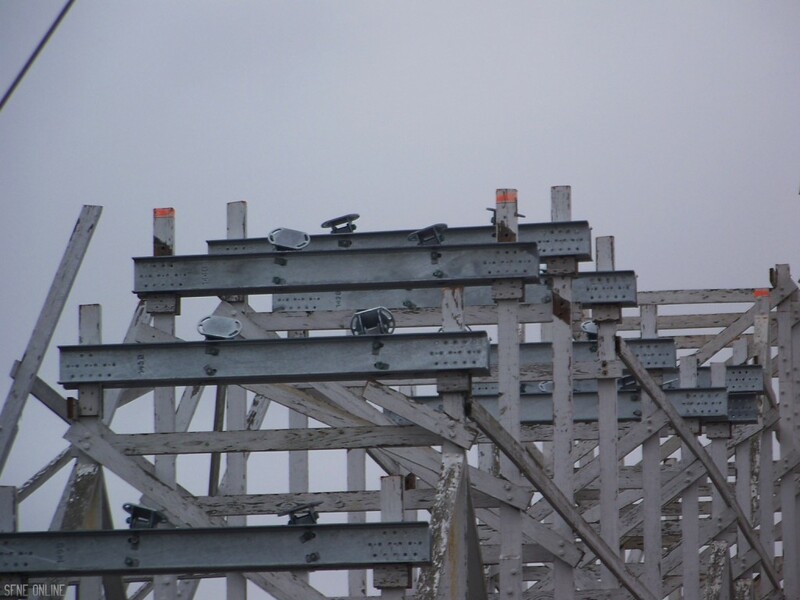 Two things… These steel supports will be staying, just like the one on the other side of the coaster. 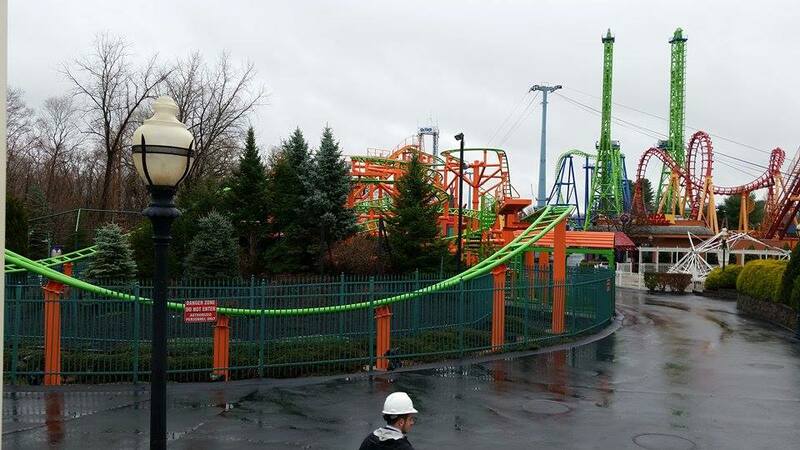 And again, Wicked Cyclone will be reusing the same entrance Cyclone had. 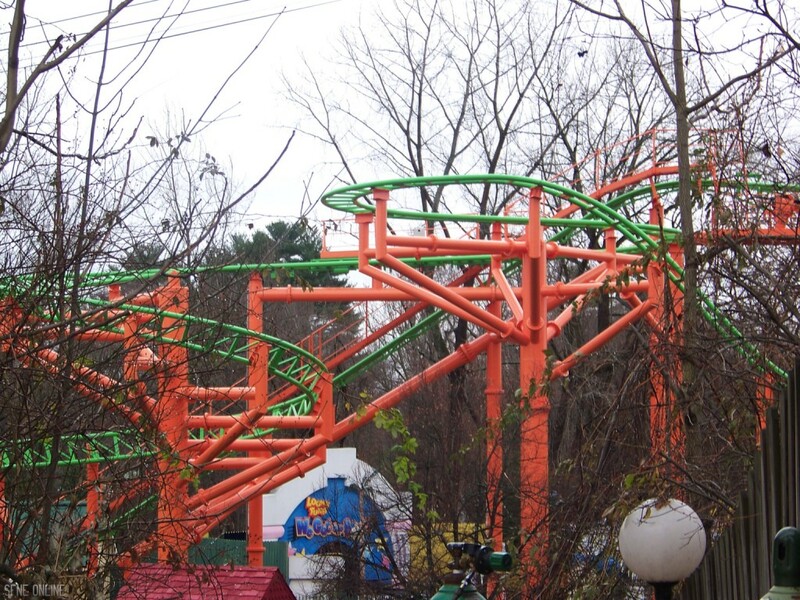 I think this is a good example of showing just how much shorter Wicked Cyclone’s elements will be compared to Cyclone. 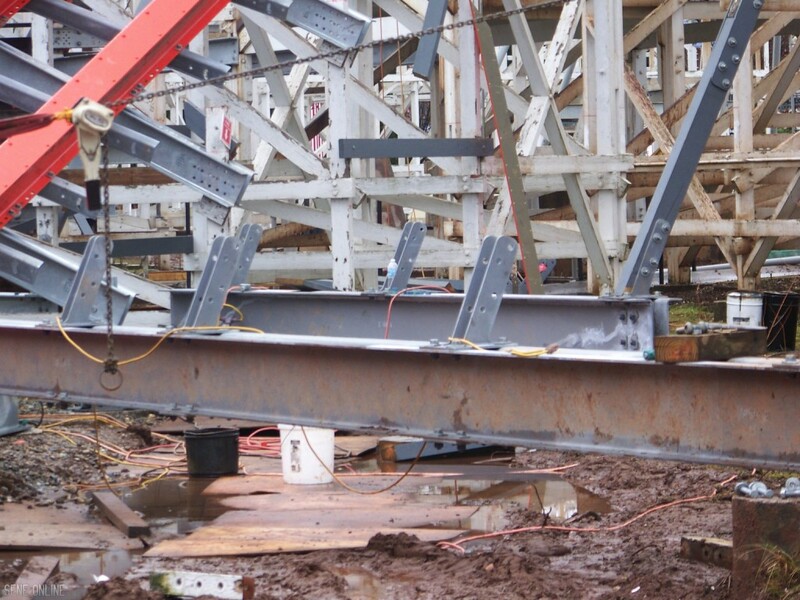 The 200-degree stall will only be a couple feet higher than where it is at now. 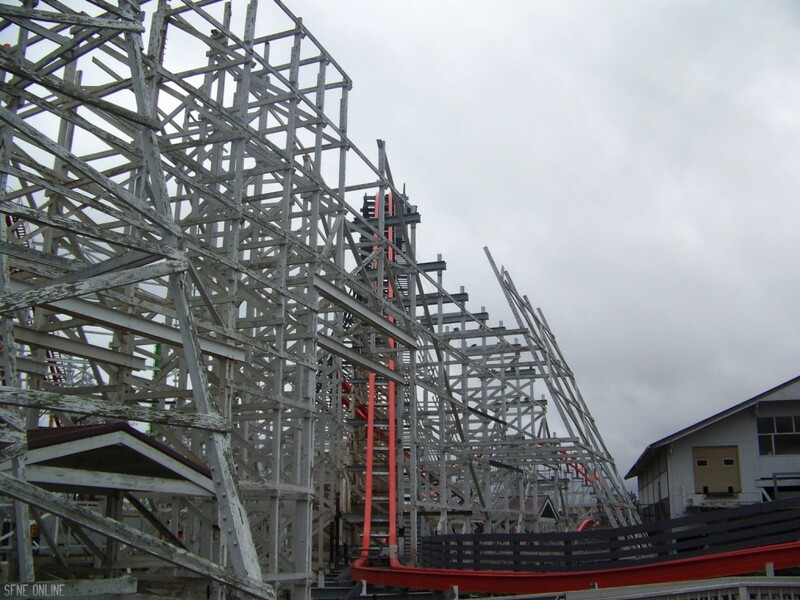 While it was Cyclone, this section used to go over the lift hill. 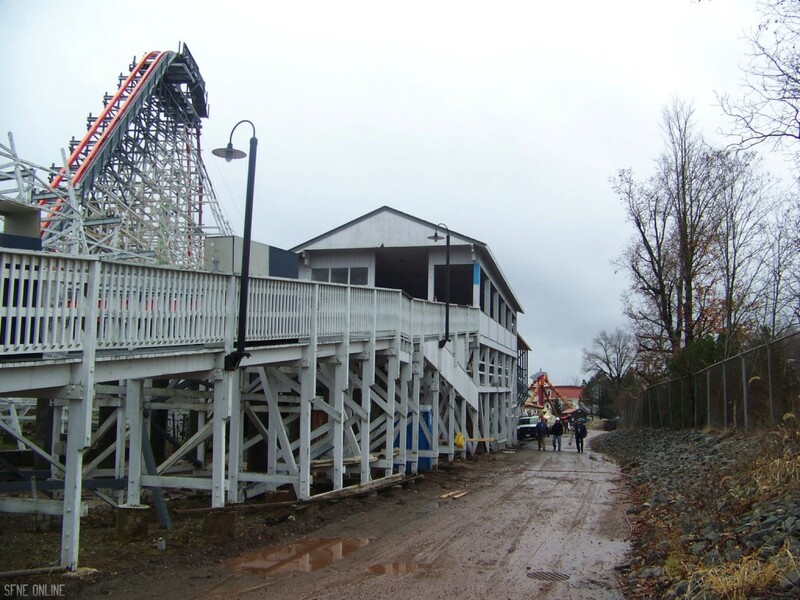 The turn out of the station will also be a little more thrilling than it was on Cyclone due to its slope. 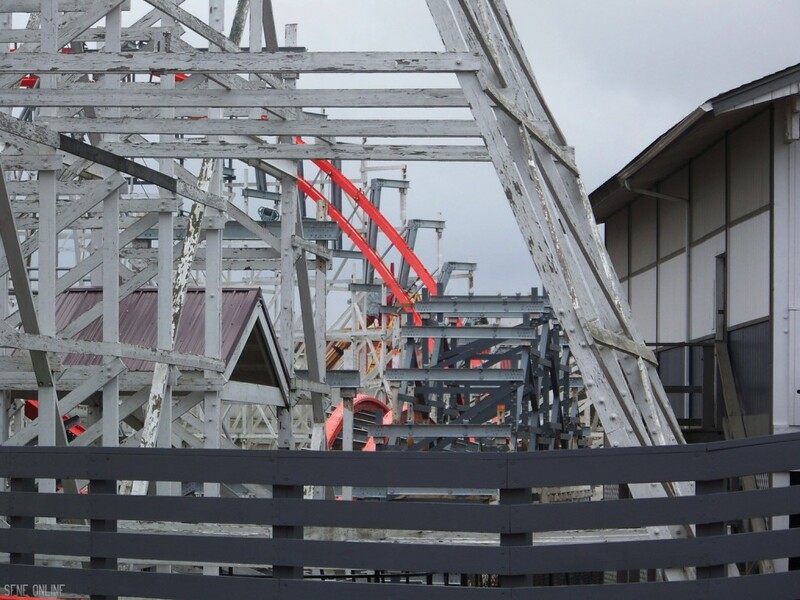 Those dark colored beams you see were where the turn for the original Cyclone used to be. 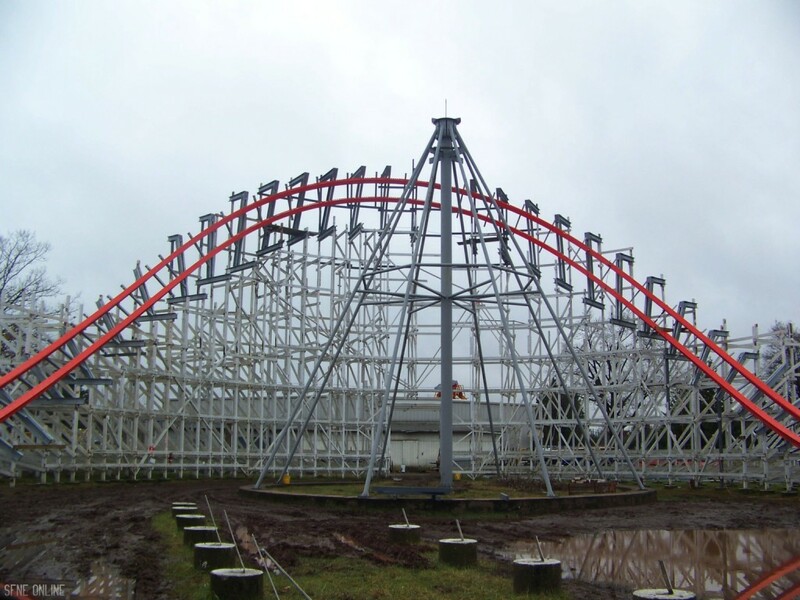 With Wicked Cyclone, it’ll be just a bit lower with a higher bank. Now we’re just outside the entrance. 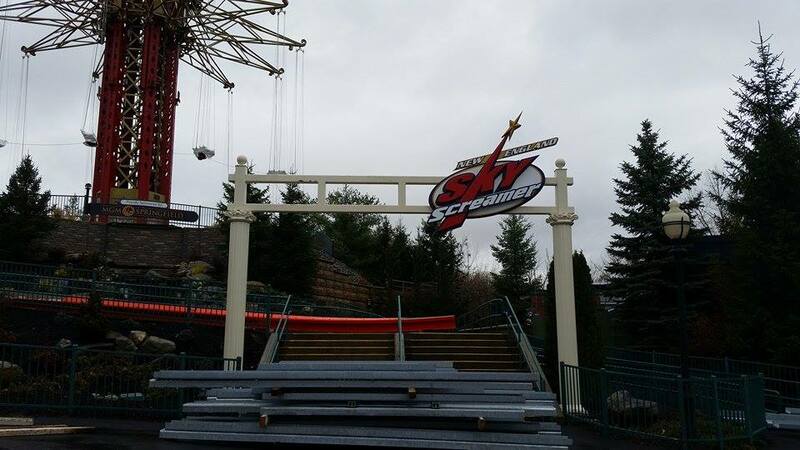 The ramp that guests take to get up to New England SkyScreamer and Wicked Cyclone is being used as a staging area. 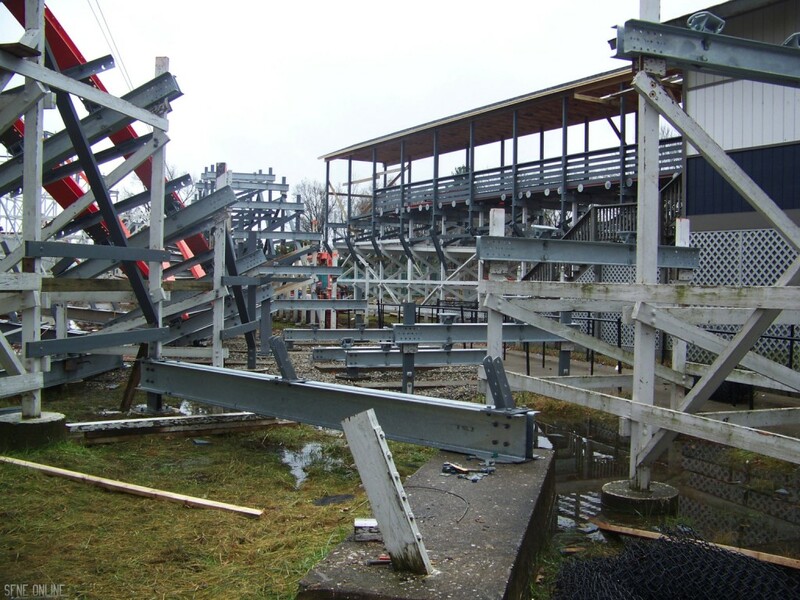 These pieces are for the 200-degree stall and the overbanked turn that follows the stall. 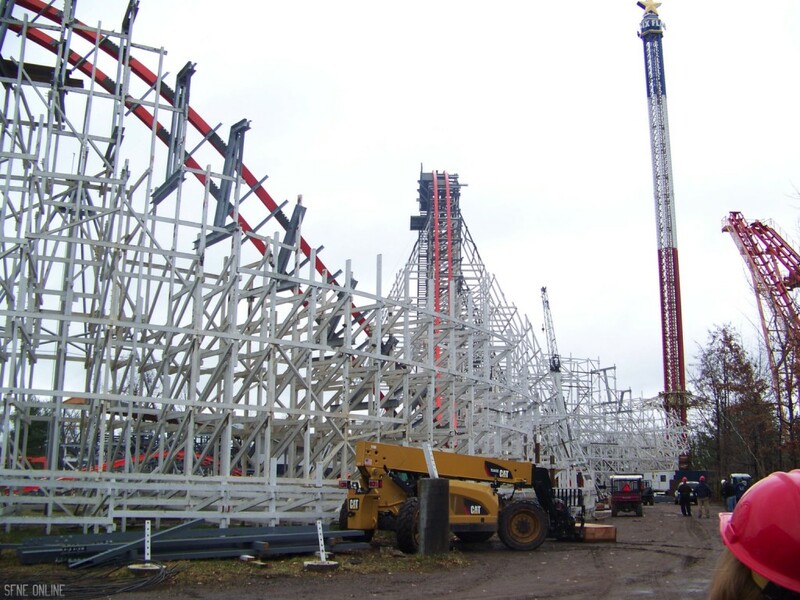 New England SkyScreamer is in off season mode. 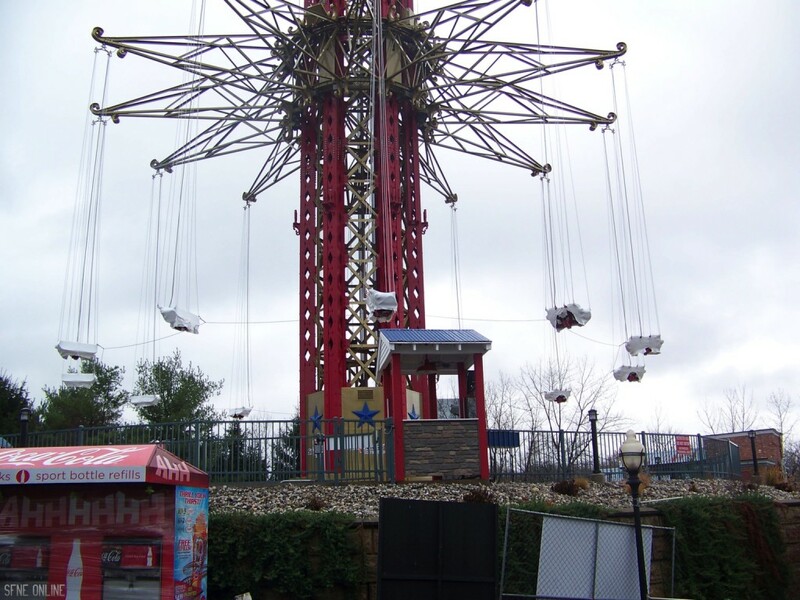 I figured that they would remove the swings from the ride carriage. It’s interesting to see that they’re elevated. 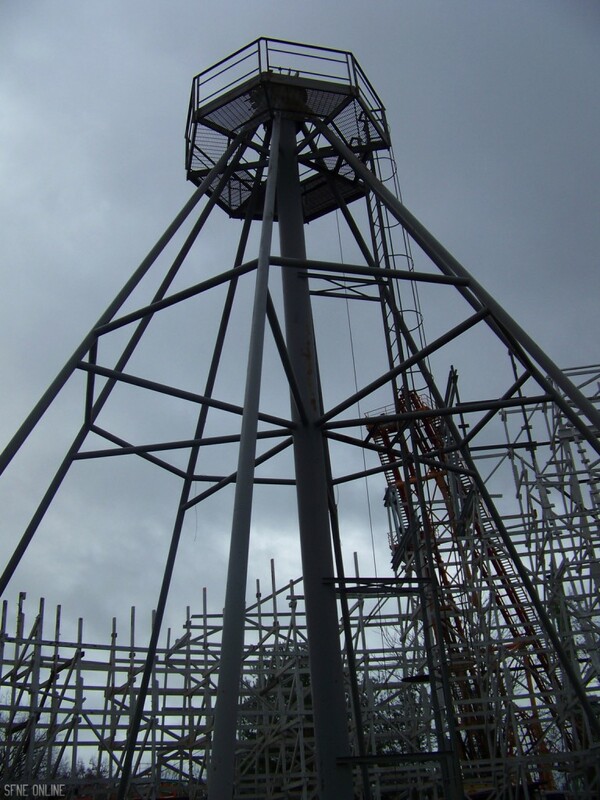 Also note the cables attached to the base of the tower to keep them from swaying in the winter storms. 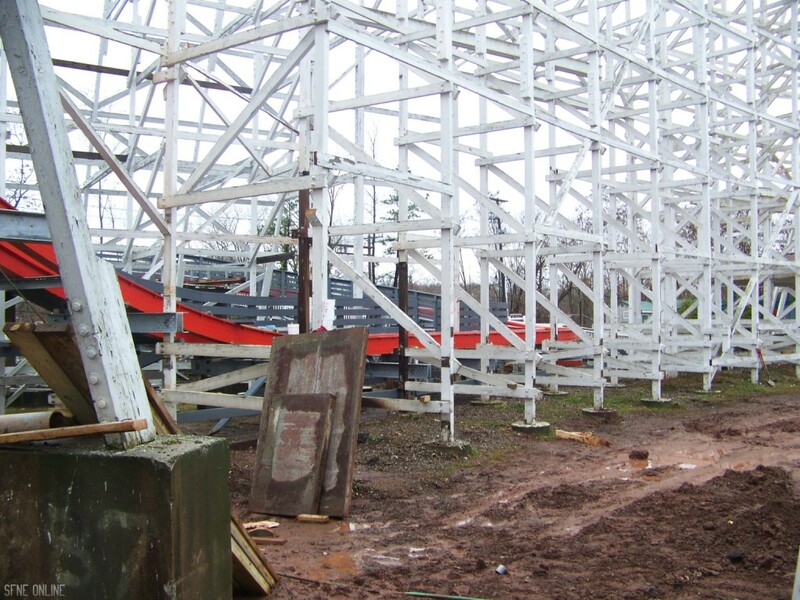 Turning our attention back to Wicked Cyclone now… This is the same shot that most of our updates from before the park closed at the beginning of the month included. If you want, you can go back and compare them to see just how much lower the double down will be than the drop that was there before. 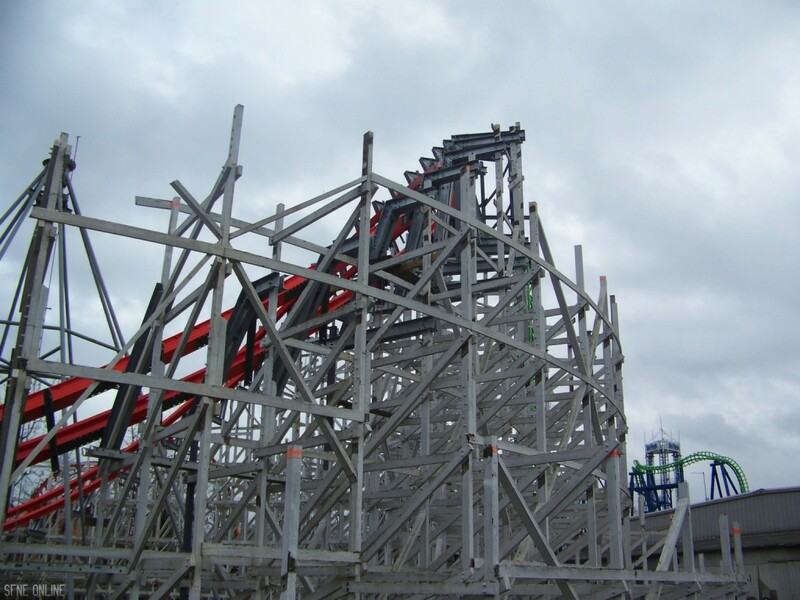 This entire layout is just going to be wicked awesome! 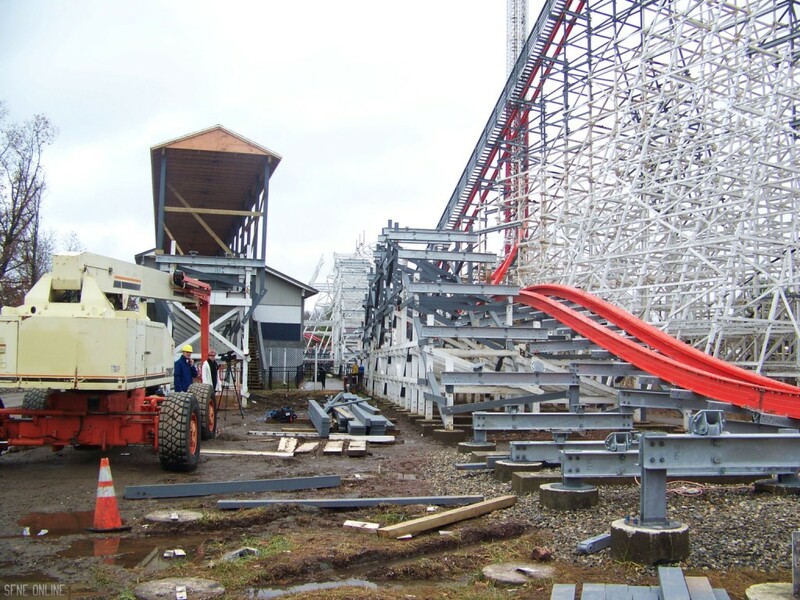 Now we’re moving along the maintenance road that passes by Cyclone’s station. This isn’t an angle that many people will ever see. 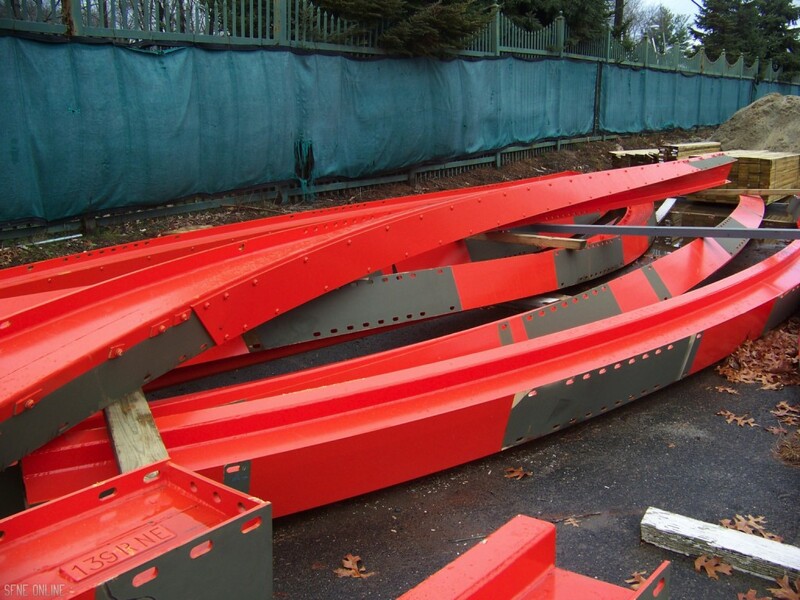 The station will eventually be painted the same color as the rest of the supports on Wicked Cyclone. 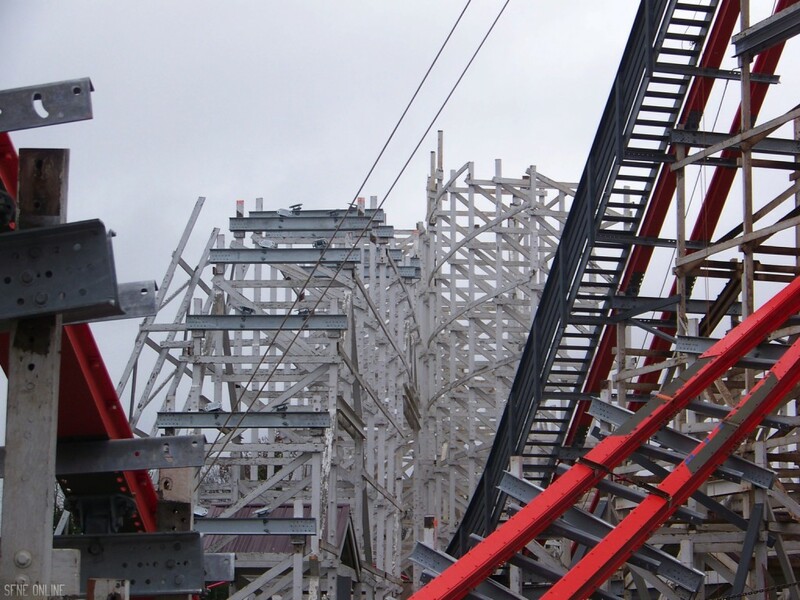 In case you didn’t know, all of Wicked Cyclone’s supports will be painted gray. See that little blue spot? 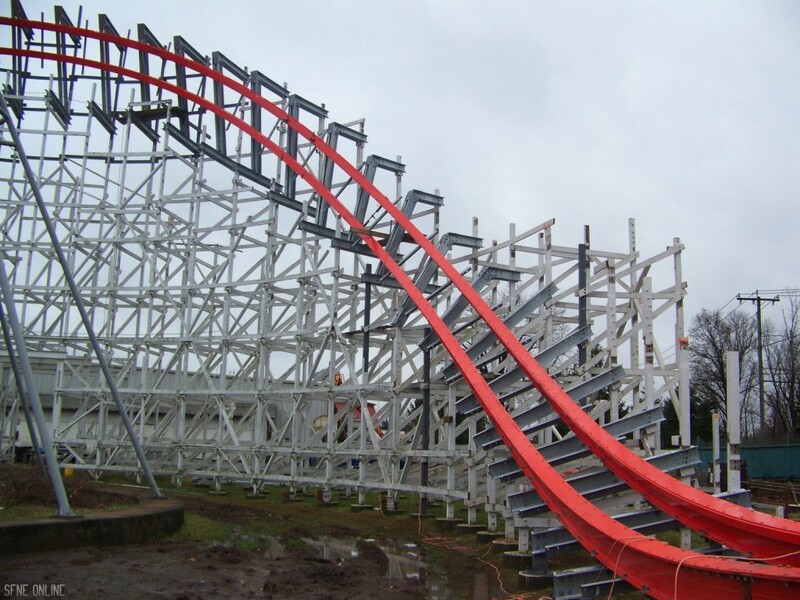 We originally used this as a piece of evidence for why the RMC conversion was going to happen to Cyclone. 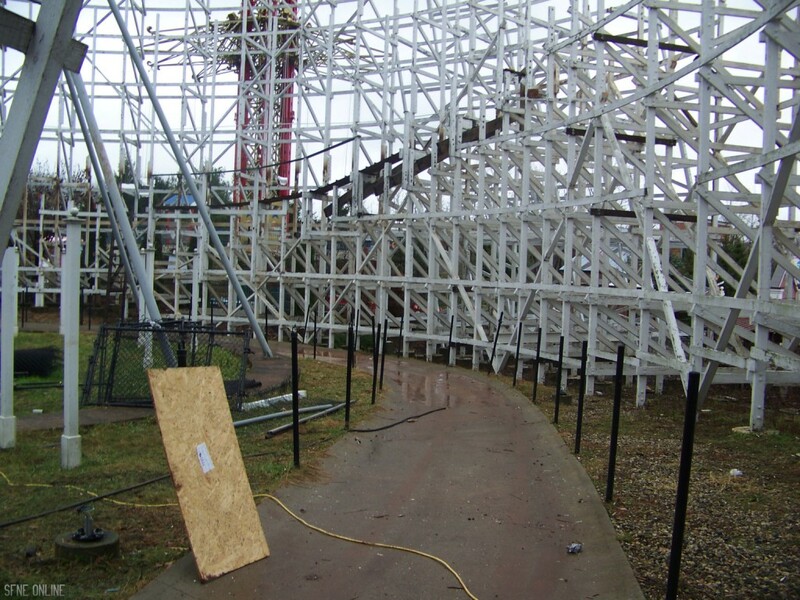 Well today we were told that there used to be a sign here. 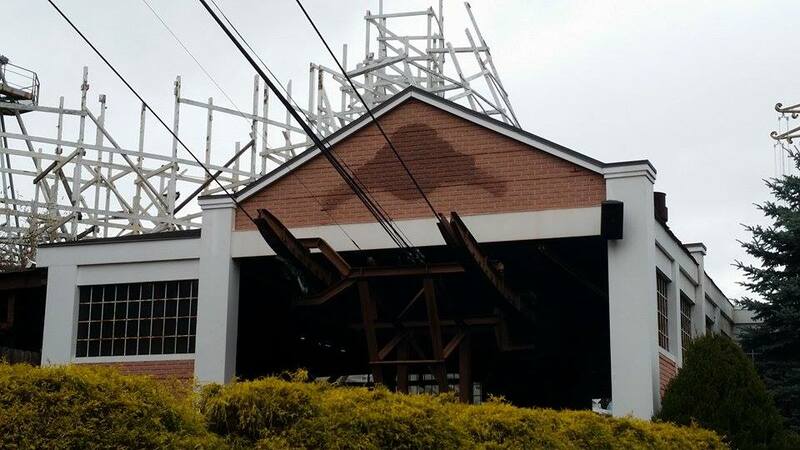 When they removed the sign, this was the color on the station. 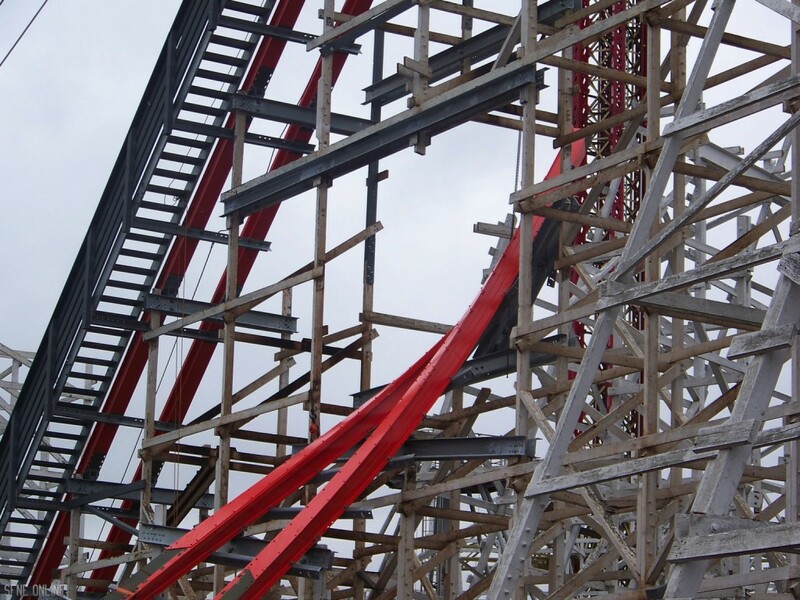 Leave it to enthusiasts to overthink something as small as that. 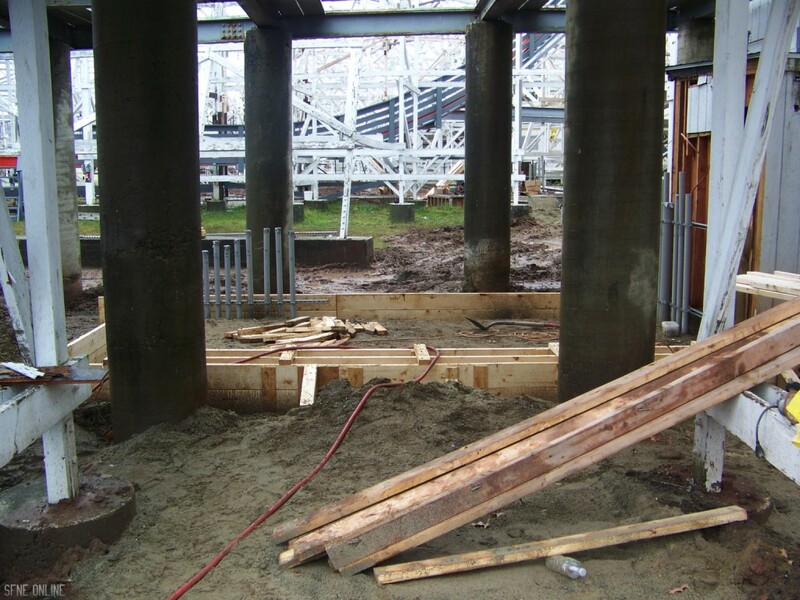 We’re thinking that this will eventually be the control area for Wicked Cyclone. 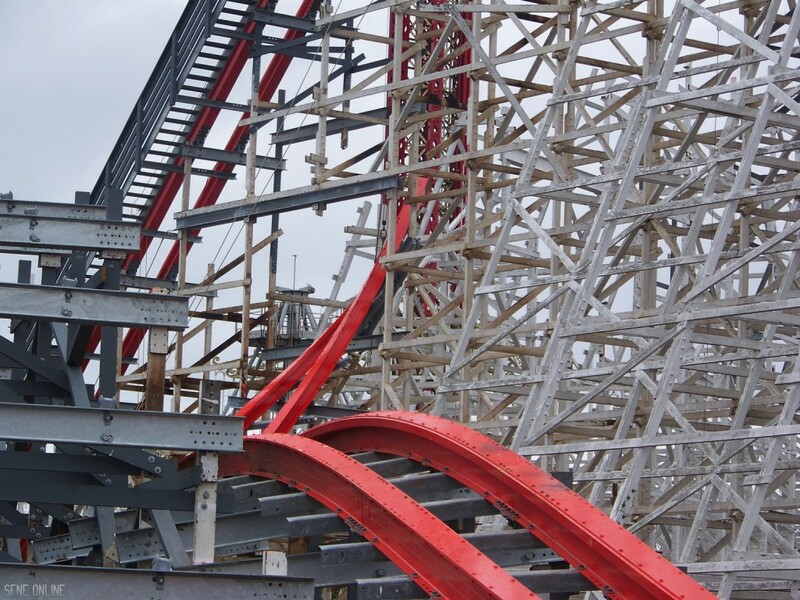 Basically it’ll be the brains of the ride. 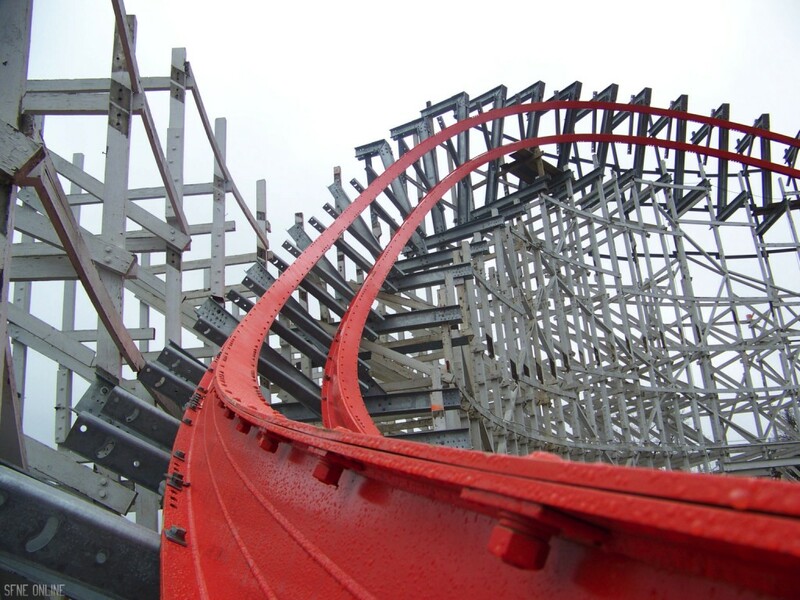 Part of the reason Wicked Cyclone needs a brand new control area is due to the magnetic braking system it’ll employ. 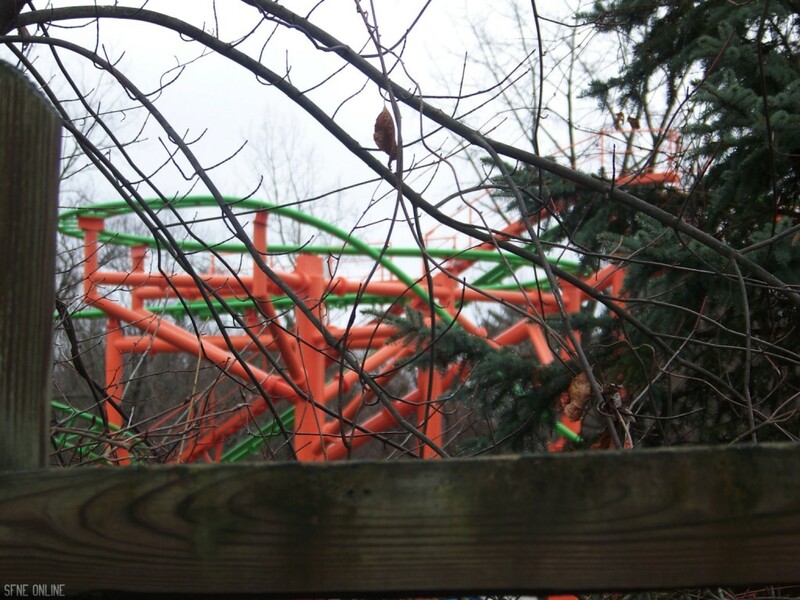 In person, the gray supports and orange track look excellent. 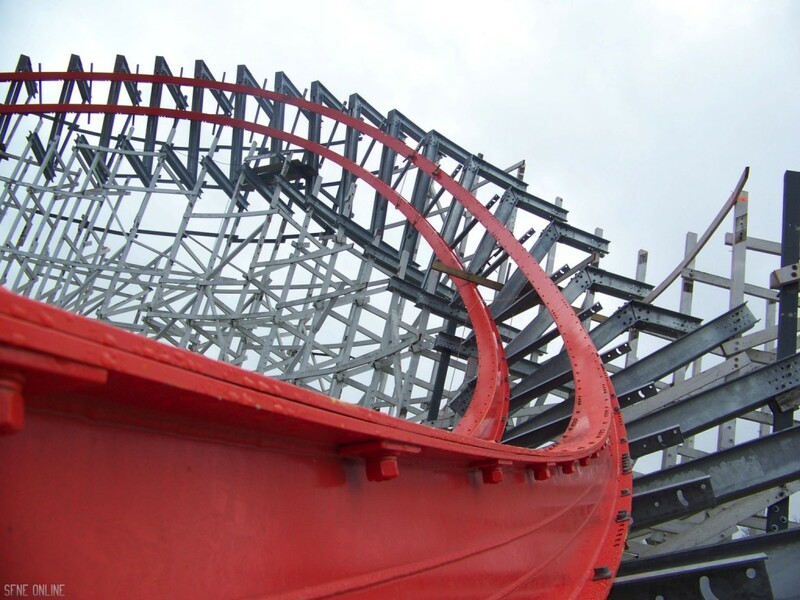 There’s no other coaster in the world that looks like this. 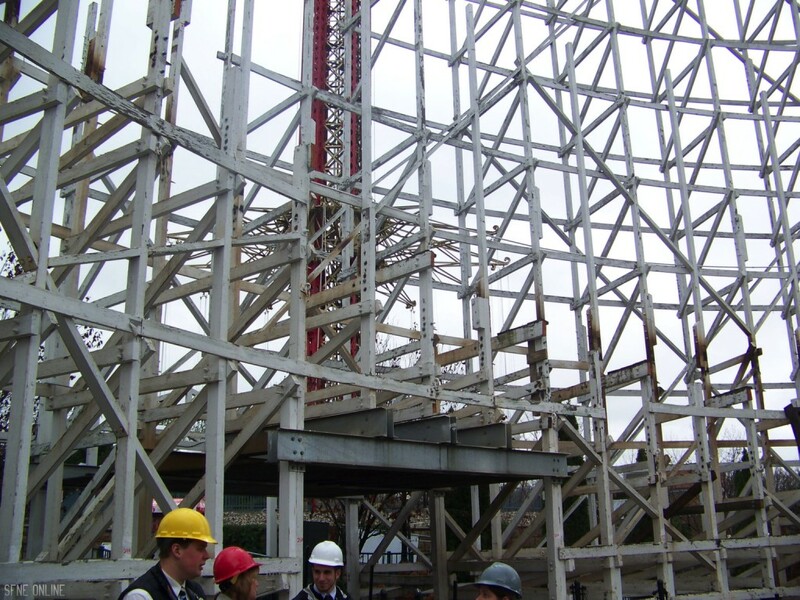 Since we were on the other side of the coaster, we thought it would be a good idea to get another look at the 200-degree stall. Seriously though… This is going to be absolutely insane! 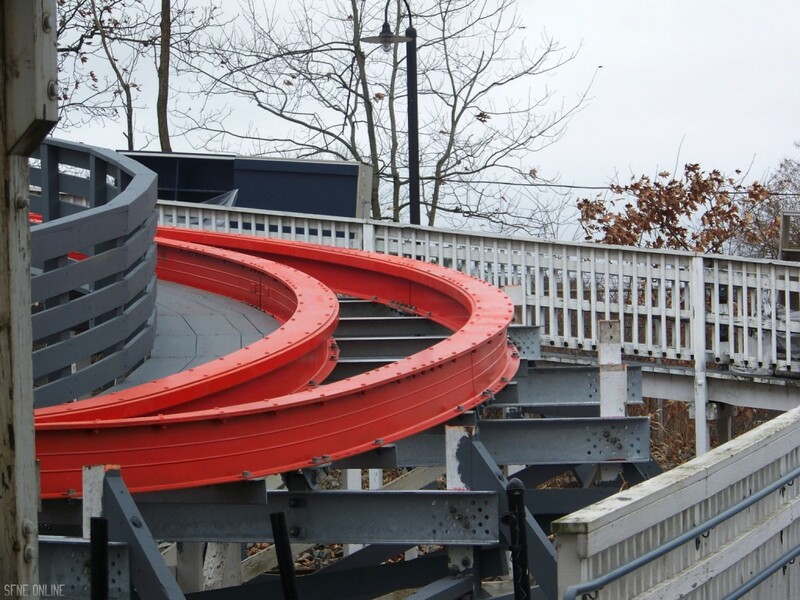 Pretty soon the turnaround that goes behind the 120-degree overbanked turn will be installed. 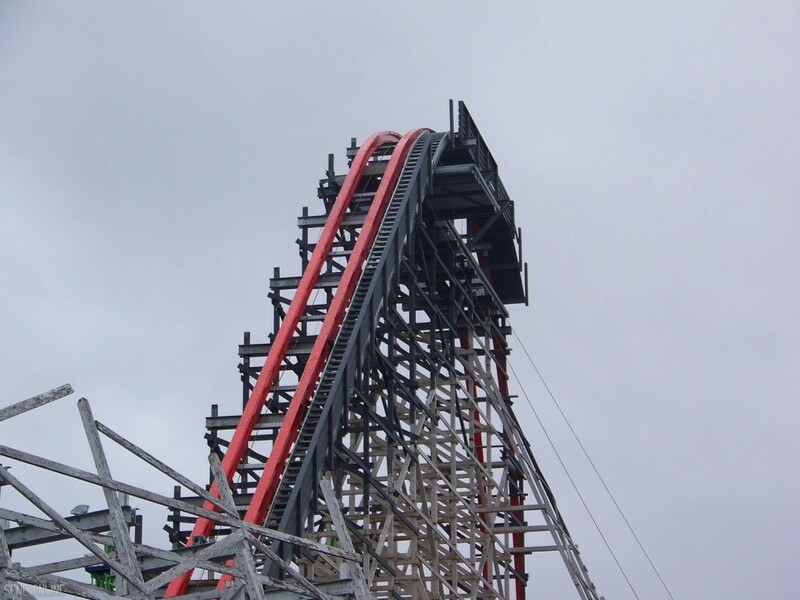 Another shot of the airtime hill after the double down. This angle is another one that gives you a good sense of just how low-to-the-ground Wicked Cyclone will be. 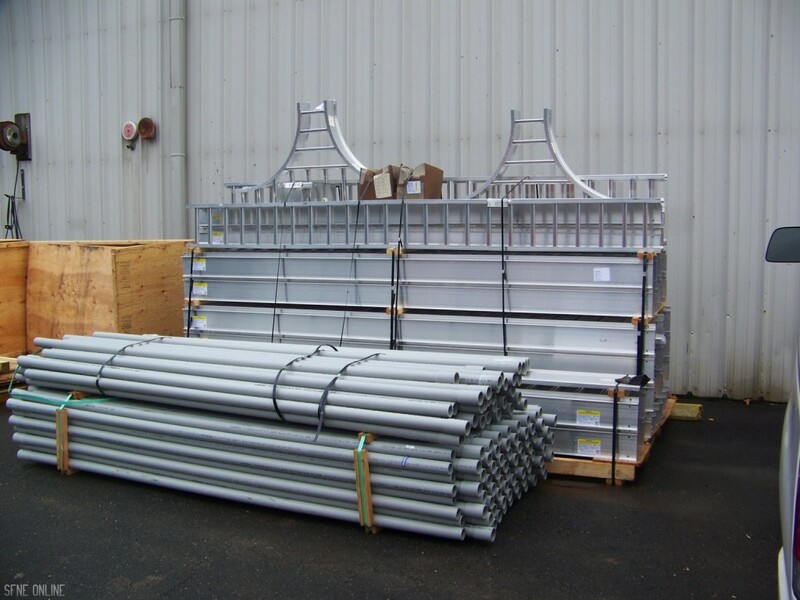 These are parts for the turnaround behind the overbanked turn. 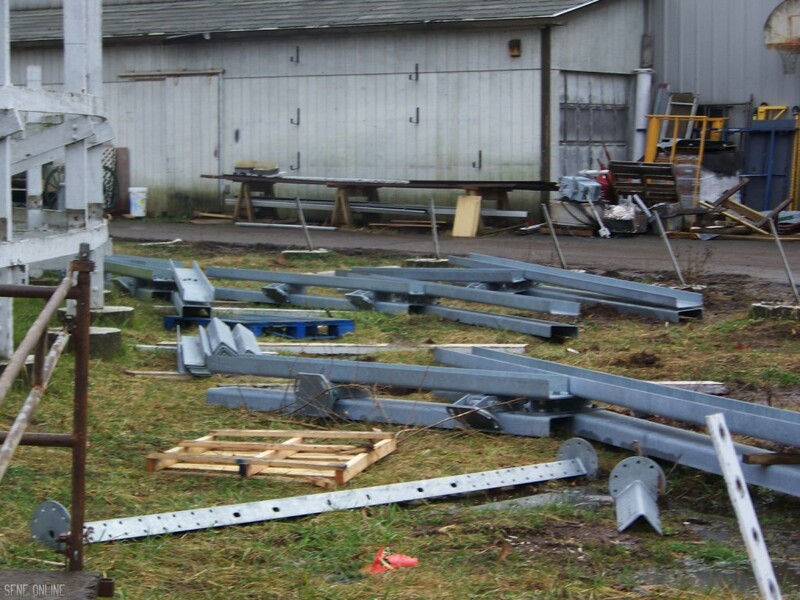 This whole section is going to look great once completed. 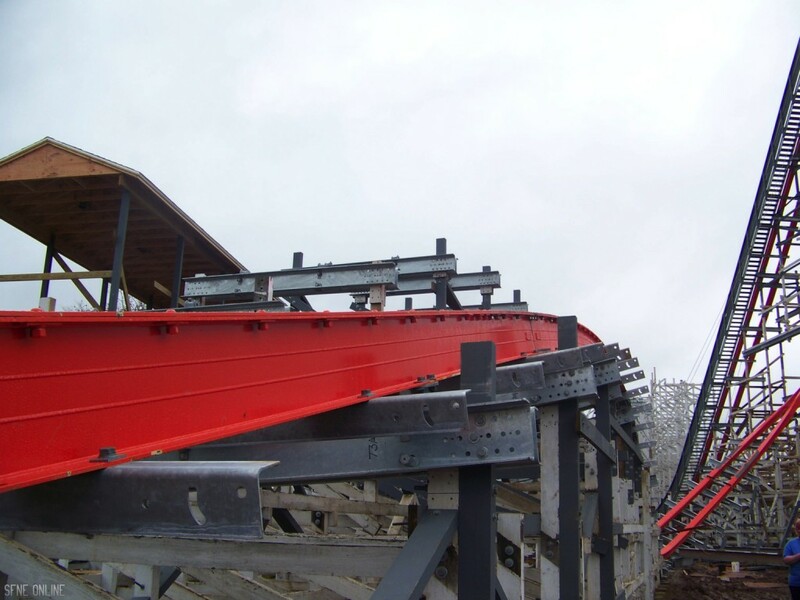 Random shot of the brake run. 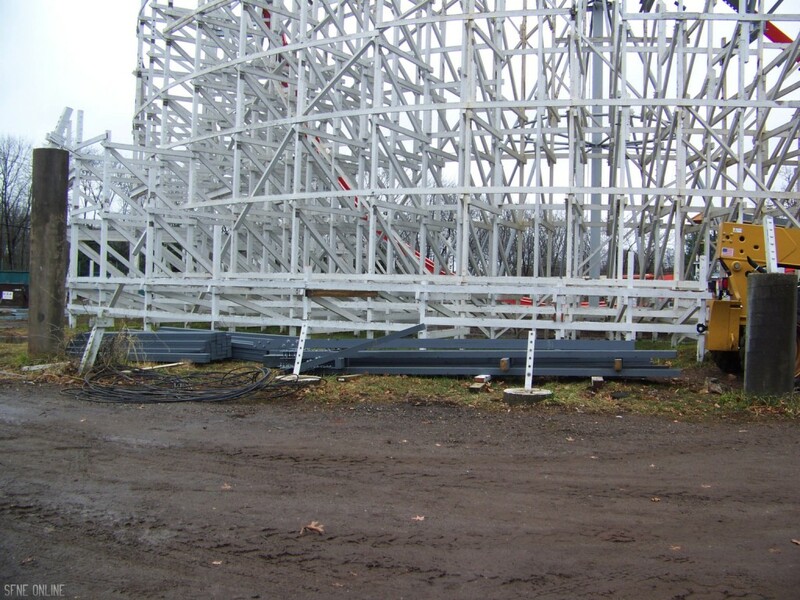 More track is on site! 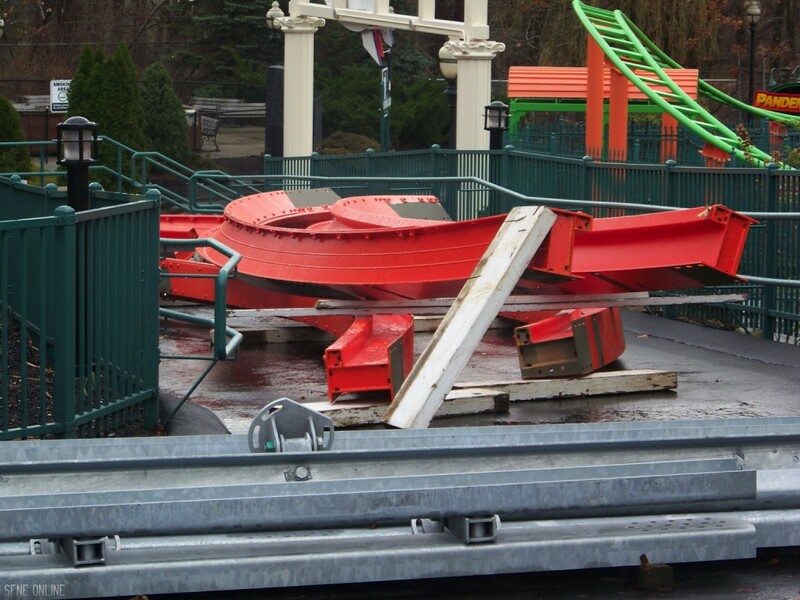 We were told that track has been arriving more and more frequently. 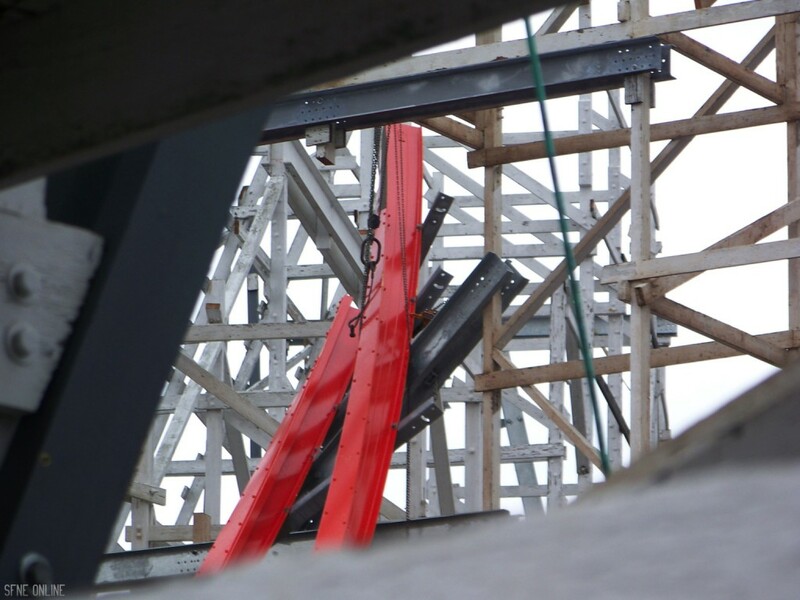 As I said earlier on in the update, the pieces for the double down are here. 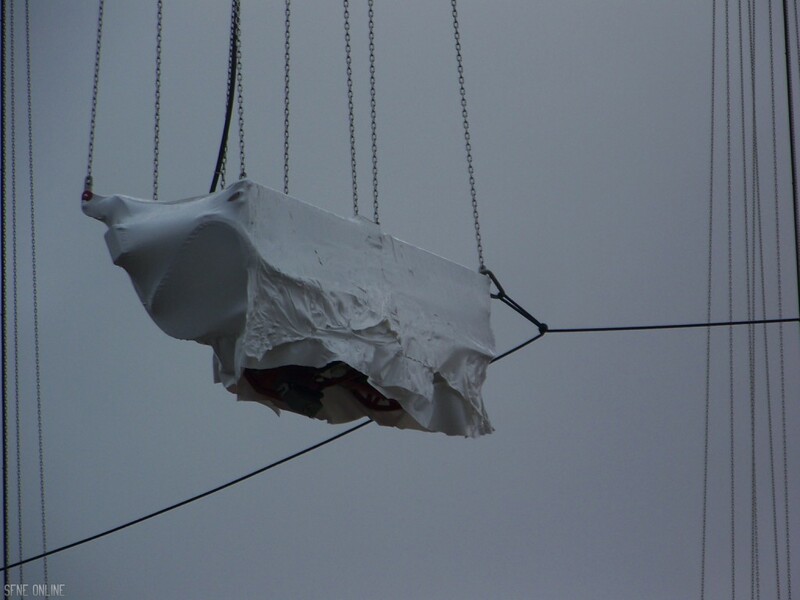 Those little plates are used to connect the top of each piece. Also notice the weird-looking ring thing. 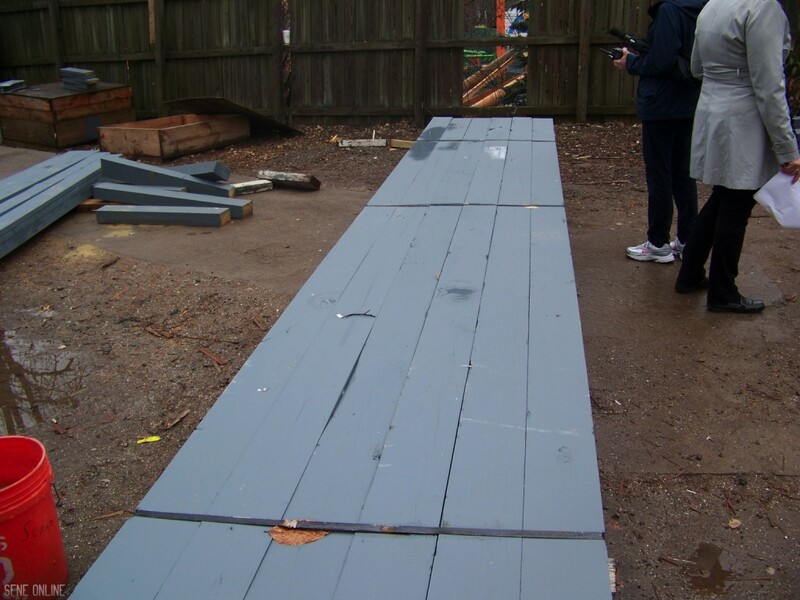 This is used as a height clearance test to make sure no one will chop off their fingers. That’s it for our pictures. 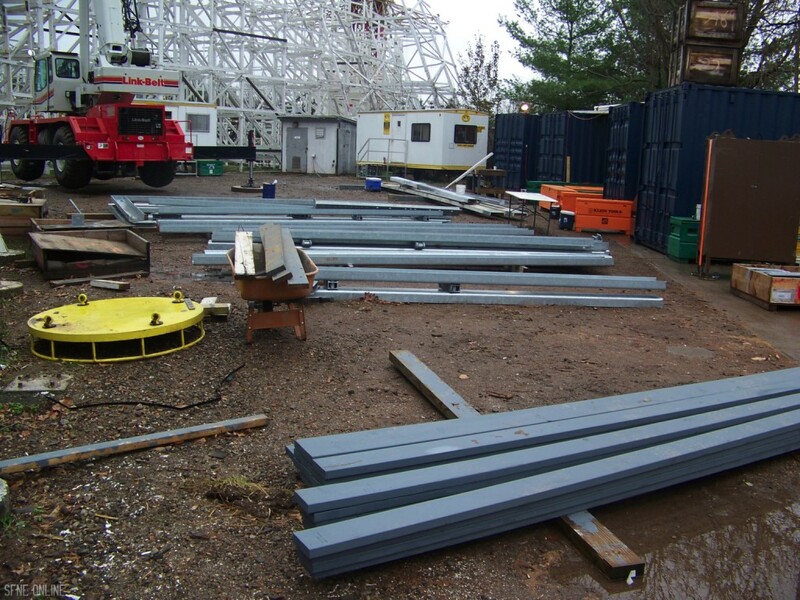 Our friend Tim from the Coaster Crew was also at the construction tour and he provided us with these pictures. He got to the park earlier so he was able to walk through the North End a bit before the construction tour started. 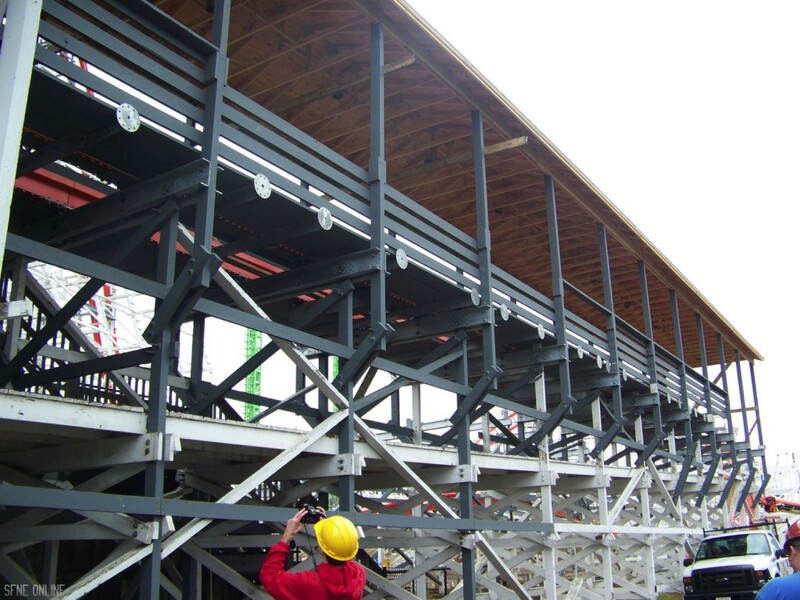 He also took some quick video of the construction site. We embedded that below as well. 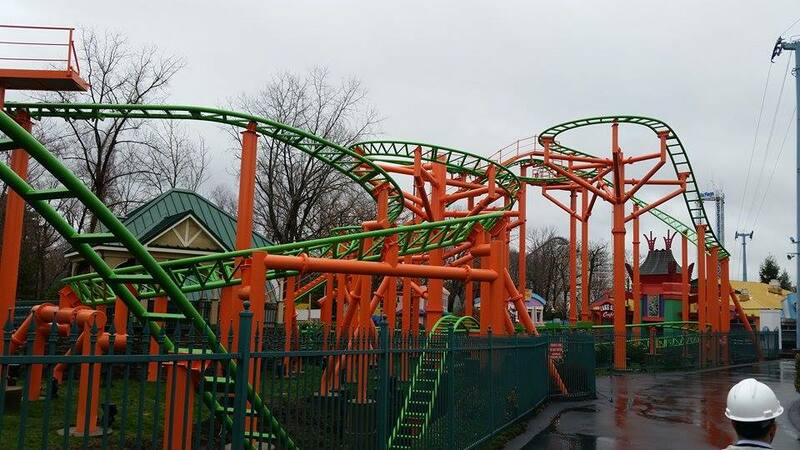 Let’s take a moment to admire the beauty of Pandemonium’s new paint job. Why did it take so long? Who knows. Who cares. It looks great. 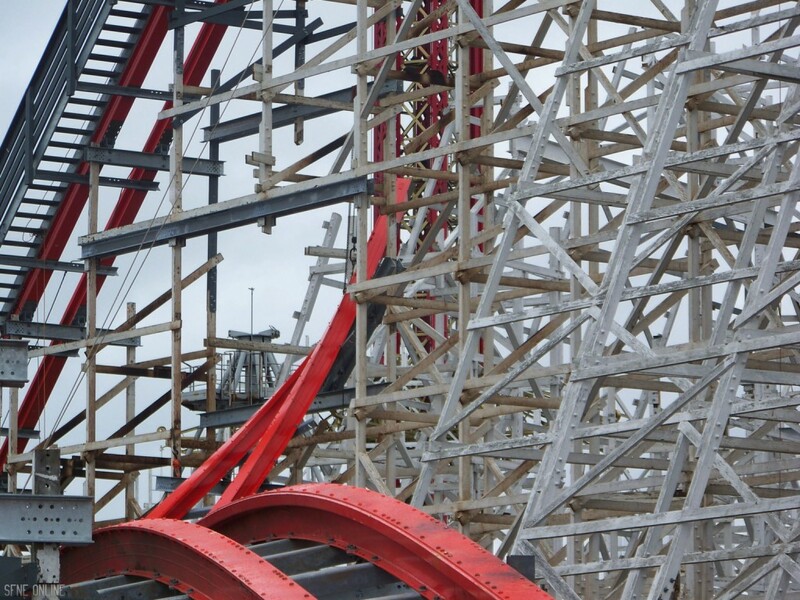 Doesn’t it look like a brand new coaster? 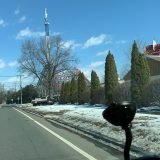 Look at it against the rest of the North End. I love it. 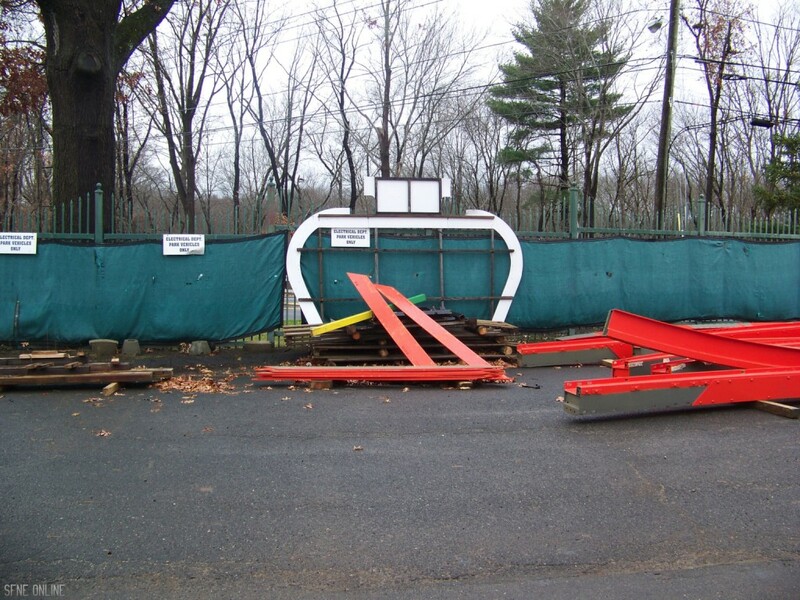 The sign for New England Skyway has been removed. The rest of the ride, however, still remains. 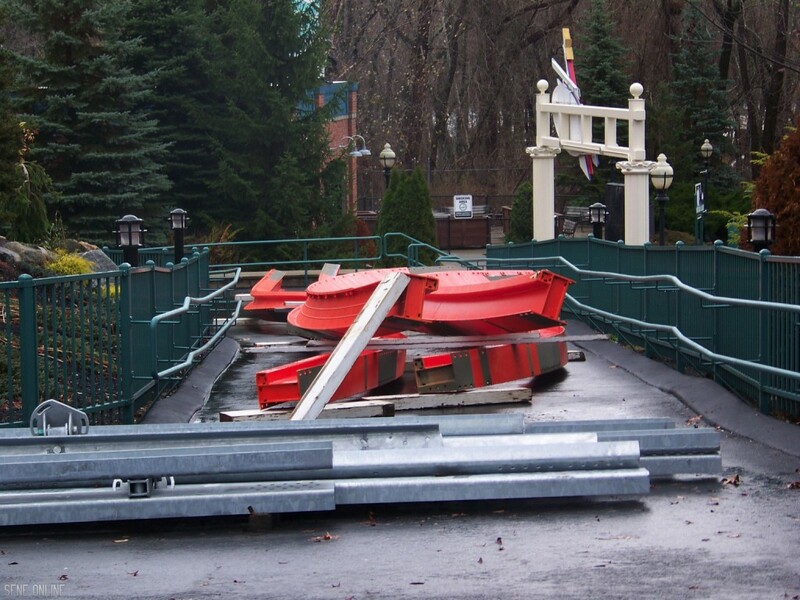 They’ll probably wait until the spring to start removing everything. 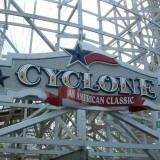 The Cyclone sign has also been removed from this new sign that they just added last year. 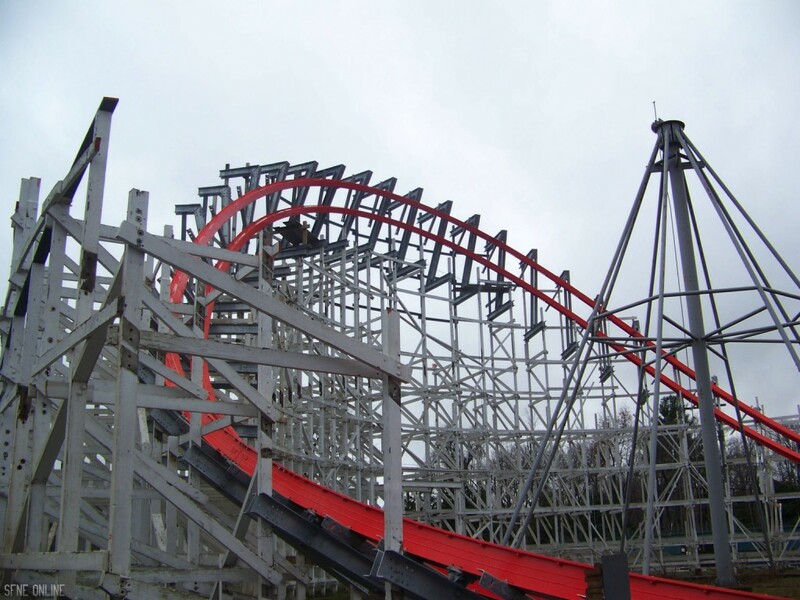 Remember when people were all like, “They’re never going to do Iron Cyclone (I still cringe when I hear it called that btw. Like, I literally just cringed when I wrote that. I sincerely hope you did too because that name was just awful…) because they just added this archway. They wouldn’t add something like that when it would just need a new sign a year later.” Well, they did. 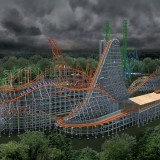 I can’t wait to see the Wicked Cyclone logo up there next year. Tim also was kind enough to take this picture of Aj. Huge thanks to Tim for letting us use his photos! 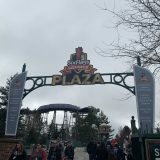 Huge thanks to Six Flags New England and Jennifer McGrath for organizing this great event today. 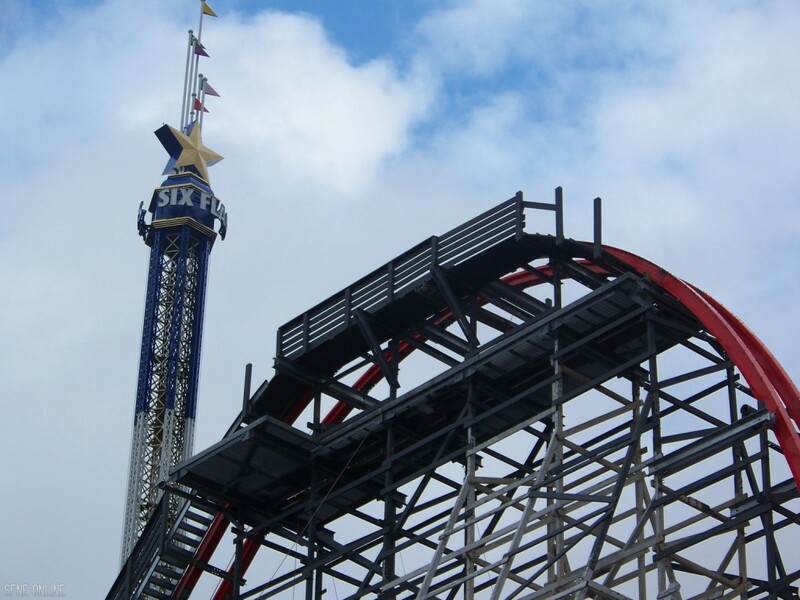 It goes without saying that SFNE has another massive hit on their hands. 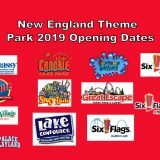 We were told that there will likely be another construction tour in January or February. We’ll let you know when it happens! Next Wednesday, the park is hosting another live Google chat. This is basically a live Q&A session with the park. 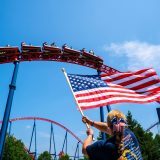 They are currently monitoring this thread on our forum, so if you have something you would like to say to them, now’s your chance. The chat will be at 7pm EST on Wednesday, December 3. We hope to see you there!